The content of this and all related space debris pages on this web site is intended for educational use only. We compile reports, accounts and illustration of factual events in the history of the space debris discipline the purpose of which is to inform. Space debris is defined as objects which made it to orbit and which eventually fell to Earth. But, this page also includes “launch debris” which did not make it into space but which fell through the atmosphere and generally floated in ocean currents and discovered at a later time. Many of the items listed herein have been published elsewhere. When that happens a “source” is shown that identifies the credit. This includes news items and photographs of specific subjects. Space debris can fall anywhere! 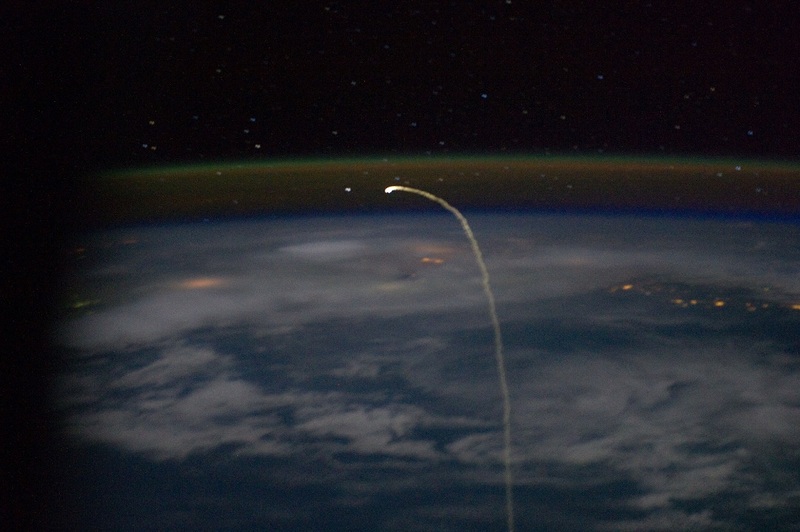 The reentry of ATV-4 as seen from the International Space Station Nov 2, 2013. The final (nondestructive) reentry of the Space Shuttle (STS-135) as seen from the International Space Station on July 21, 2011. Space debris might be defined as material orbiting the Earth that has outlived its useful lifetime. 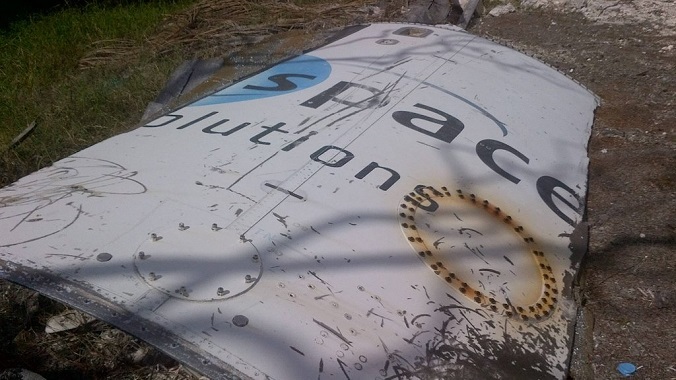 We employ this term to cover a) satellites that have become inactive, b) discarded rocket bodies, c) small pieces of material jettisoned or having flaked off spacecraft, d) small objects that are the results of collisions or explosions in space, or e) portions of payload fairings and other material that fall off an ascending rocket on its way into space. Some very old satellites have been known to ‘shed’ small pieces decades after they were launched into space. 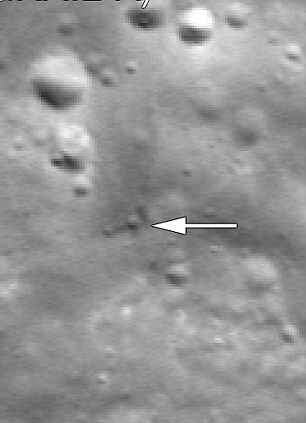 In addition to documenting cases where debris was located on Earth, we also include cases of ‘debris’ sites on the Moon and Mars. Sometimes what seems to pass for space or launch debris is actually something else. 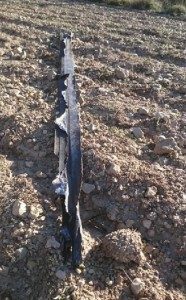 A rocket that fell in Jordan on March 17, 2017–not space debris but part of continuing ground conflict in the Middle East between various parties. Courtesy Mohammad Odeh. 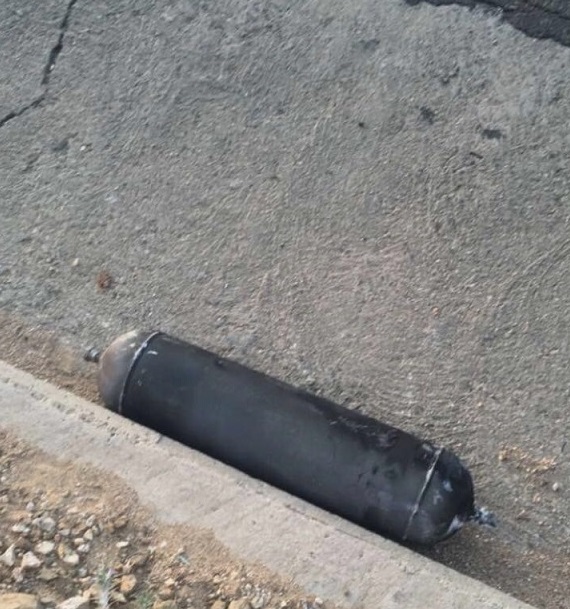 This pressure tank about 2 feet in length was found next to a curb in a small town in Saudi Arabia in August 2016 after a missile had been fired from Yemen. 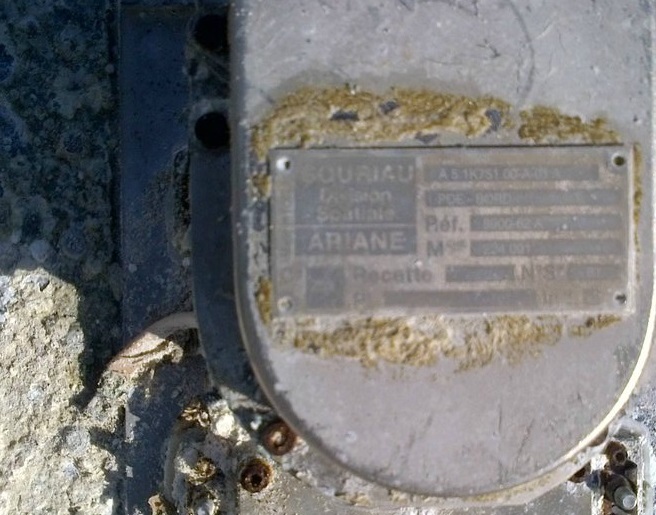 In the images below, parts of an inertial measurement unit were found in the remnants of an old building in Wisconsin in early 2010 and were initially thought to be pieces of a rocket. Upon closer inspection there are no burn marks. Although the unit was embedded partly into the earth, there is no direct evidence indicating that it reentered the atmosphere. 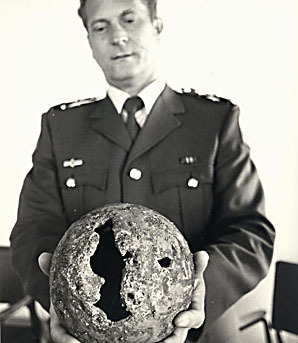 A more recent case involved a 2013 release of information related to a 1978 reported debris find in New Zealand: Throughout the 1970s, Canterbury was showered with space junk – some thought to be real; others proven to be fake. 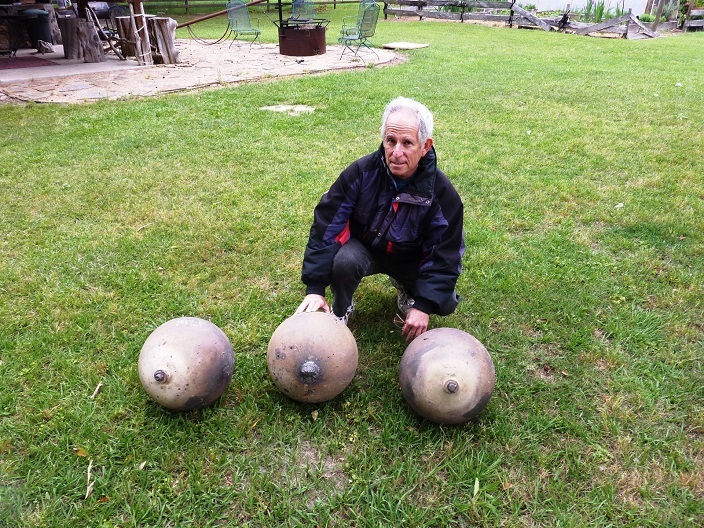 Metal balls found scattered on paddocks from Lake Aviemore to south of Ashburton in 1972 are widely thought to be of Soviet origin. In October 1978, two other pieces of space junk made headlines after they were found on the Eiffelton property of John Lovett. It was revealed that three of his friends found some old aluminum fish floats, scorched them with a welding torch and dumped them in his paddock. Documents released by US public records agency MuckRock shows the lengths New Zealand scientists had to go through to reach that conclusion. Communications from 1978 between the State Department and the US embassy in Wellington show the fishing floats went through radiation testing and were examined by scientists at the then Department of Scientific and Industrial Research (DSIR). According to a message the embassy sent to the State Department in November 1978, an Ashburton milkman reported an object flying through the sky on October 23. 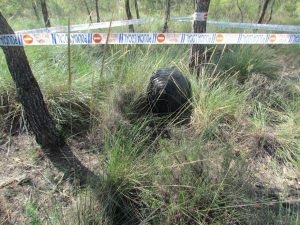 “John Lovett claims to have been in the paddock on October 22 and is certain the fragment, which was prominently located, was not in the paddock at that time.” A second message from the embassy said it was “suspect” that the ball landed only eight kilometers south of where the 1972 balls landed. “DSIR’s advice … that the sphere was a silicon-aluminum alloy with a melting point of less than 600 degrees caused doubt that a space object with such a low melting point could survive re-entry … even if shielded,” it said. “The discovery of a second sphere on November 5, however, seems to increase the likelihood that the objects are indeed space fragments … “‘ Scientists thought “magnetic globules” on the surface of the balls were molten steel. 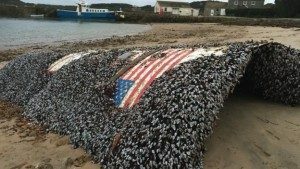 Later that month, they were found to be welded fishing floats. One of the 1972 “real” space balls is now in the Ashburton Aviation Museum. Curator Jim Chivers said the US documents were a fascinating insight into the then government’s interest. 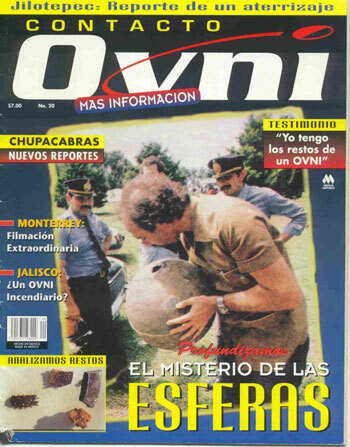 “The finding of the balls created a great deal of interest from the United States, with much informational data and photographs being requested by their space agency.” He said the level of interest from the US government was never known because all its information was classified “secret and confidential”. “It appears from some of these no longer secret documents that it took quite some work before the hoax balls proved to be just that.” He said the perpetrators would have been pleased with their efforts. 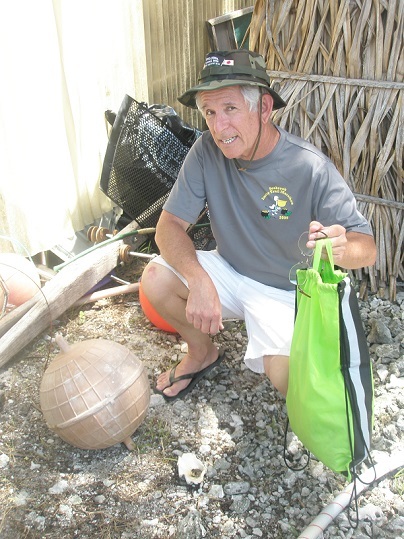 “Had they known that as well as convincing John Lovett that he had found a spaceball, they almost fooled the American space agency as well … They would have been very pleased,” he said. Other hoaxes have been attempted such as with a spherical ball similar to the one below. 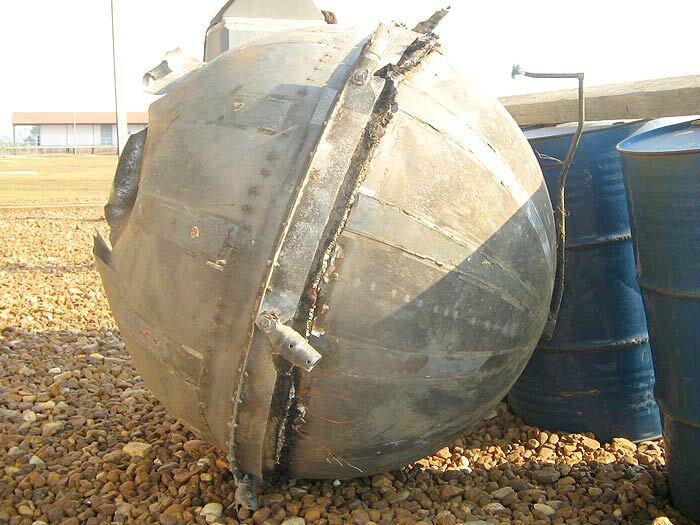 Although this one quite obviously is not a pressurized sphere that is easily mistaken for space debris (it is a welded fishing float that looks similar to a helium pressure tank), others have been. Paul Maley with a metallic sphere that is actually a float. Found in Tarawa, Republic of Kiribati May 11, 2013. 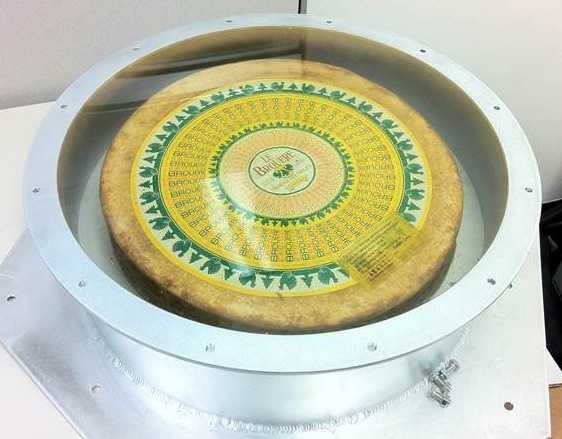 During the week of December 10, 2010 the first Dragon capsule was launched into space with a wheel of Le Brouere cheese as a payload. It could only be hoped that such an object may survive reentry in the future and be recovered as “space debris”. A reentering spacecraft is similar to that of a meteor or small asteroid body with some notable differences. Many reports by local people, regardless of the country of origin, appear on YouTube or other public information source without basic critical pieces of information. 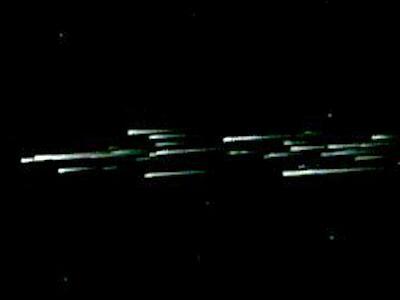 The photo below is similar to what may be seen during a spectacular reentry. b. time (converted to GMT) of the observation; a description of how this time was obtained. For example, using a watch with a second hand, a clock on the wall, a calibrated time source. c. direction of motion from beginning to end. It is important to know how the directions were obtained: using buildings as a reference, street layout, knowledge of the constellations, or guess work. e. description of what was seen including the presence of any sounds e. video or time exposure photographs; information about the key reference points seen in the video such as structures, mountains, etc. from which directions can later be obtained. f. astronomical experience (if any) of the reporting observer g. degree of certainty or uncertainty in any of the information above In most situations, it will not be possible to find any recoverable pieces. It is only in those exceptional cases where there are many reports along the entire reentry track as well as luck where one or more pieces may be found. Usually such debris is found within hours of its fall and only because someone was nearby and found it. 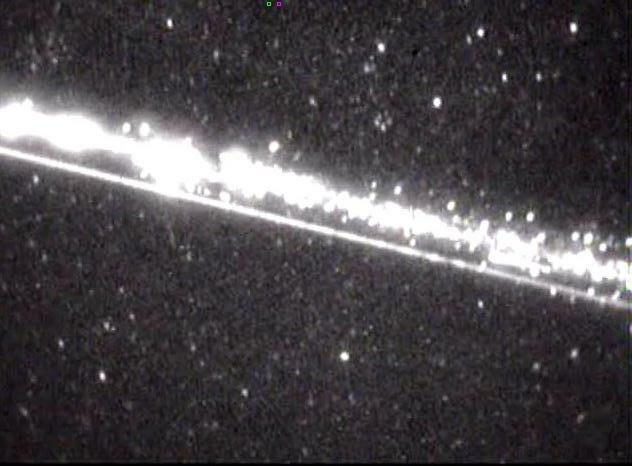 Space debris usually has a dozen or more fragments appearing along the trail, some appearing, then disappearing, others lasting along the entire flight path. The train of fragments may extend across the entire sky or vanish after 20 or 30 degrees. It depends on the location of the observer with respect to the reentry path. The amount of time spent in the sky could be from 20 seconds to 90 seconds, but this is just a guideline. Sonic booms are rarely heard. For investigators with the skill, ability, resources and time to hunt for objects, the more reports with accurate details will enable the likelihood of recovery to occur. This is the same process that meteorite hunters might use to recover debris. Fireballs that appear in the sky that are not space debris may come from any direction in the sky. Their speed is usually (but not always) faster than the slow moving train of space debris. They may break up into two or more noticeable fragments which travel in similar directions. The duration of such entries last anywhere from a second or two to perhaps 15 seconds. 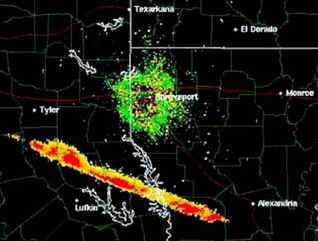 A smoke train may or may not be left in the sky and rarely a sonic boom might be heard. To whom do you report the sighting? First go to this site: http://srop.falakcenter.com/ and using the FAQ, determine if it was a reentry or perhaps something else. If you think it was a reentry, then please submit a report through this site. Posting videos on YouTube is one location. Generally someone with knowledge will spot this posting. Otherwise you should attempt to contact a local representative from perhaps a planetarium, observatory or astronomical society. Local news media may also be helpful in publicizing photos or accounts that could be noticed by responsible scientific bodies. Accuracy in reporting the above mentioned details is critical to helping determine the nature of what was seen and to eliminate other possibilities. The term “reentry” is a misnomer. It implies that an object has entered an atmosphere, survived and is now entering again. Almost every satellite that encounters the atmosphere (unless it is designed to resist the heating of reentry) will either be partly or completely destroyed and will certainly not reenter. An exception has been the Space Shuttle or other human-operated craft. Another is a capsule that is engineered to land via parachute or other system that returns samples. Forces and heating during the process are such that man-made objects will have a hard time surviving the length of time, peak heating temperatures, and pressures involved in the high velocity encounter. When part of a satellite does survive it can take many unexpected forms, the most varied may be that of the Space Shuttle COLUMBIA which broke up about 40 miles above the earth’s surface in February 2003. All kinds of mechanical and electrical components, pieces of paper, clothes and even some human body parts were recovered; many were in ‘recognizable condition’. 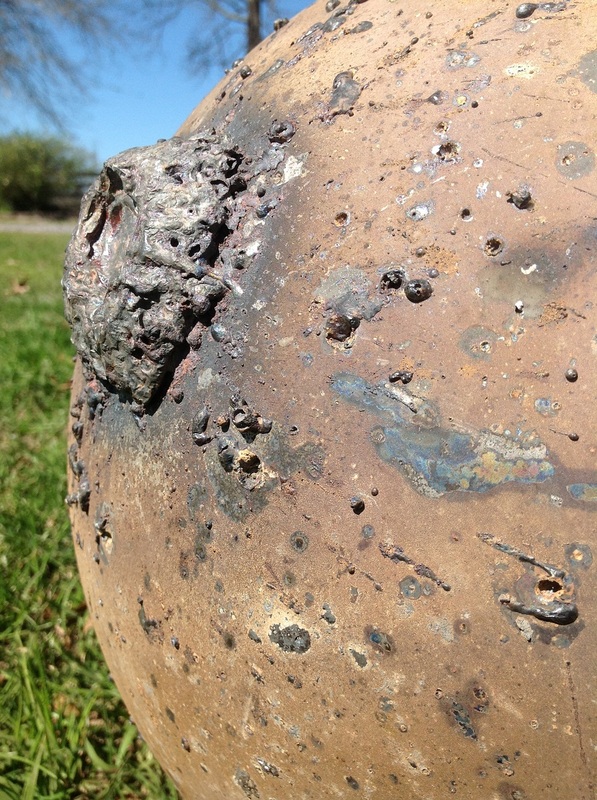 Other pieces or suspected pieces of debris may take a familiar form such as a metallic sphere. In Many instances space debris will have no markings. 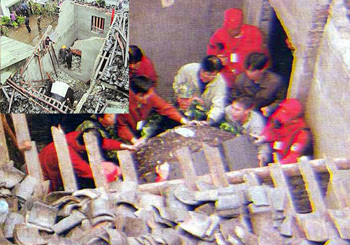 Tabloids are known to sensationalize some debris falls such as in the image below. Magazine cover “The mystery of the spheres”. Accounts listed here are dated sometimes based on when I received the information or when documented and may not reflect the actual/estimated fall or recovery dates. SPACE DEBRIS PAGE: 2004 TO THE PRESENT TIME. A pressurant tank from Iridium 70 spacecraft which reentered October 11, 2018 was located on a ranch 2 days later. The owner of the ranch near Hanford spotted the big chunk of metal in his walnut orchard on Oct. 13 and alerted local authorities. The purpose of the tank was to store fuel used to change the orbit of the satellite in space. 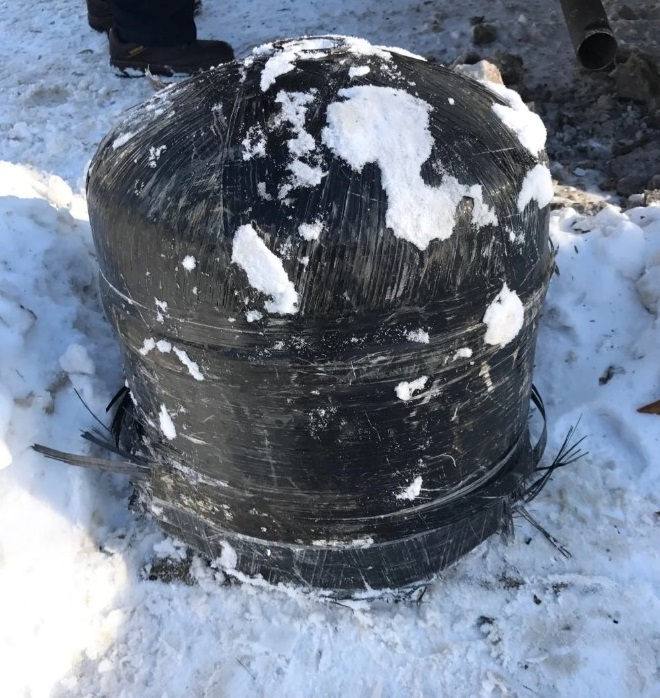 The tank could be positively identified due to governmental agencies tracking space debris, the Kings County Sheriff’s Office said. 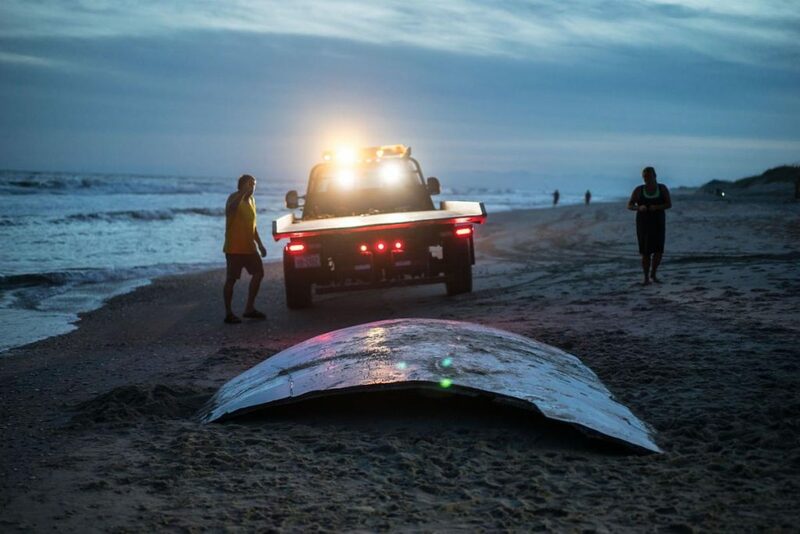 Iridium told local officials the tank is of special interest because it is the first piece recovered from an Iridium satellite re-entering Earth’s atmosphere, so it will be closely examined. Most low-Earth orbit satellites end up burning up in the atmosphere or landing in the ocean. The tank was turned over to an employee of Iridium who journeyed Wednesday to Hanford from Tempe, Arizona to retrieve it. “It is a surprising discovery that we make the managers of the farm of Quéménès located in Brittany on the island of Iroise. 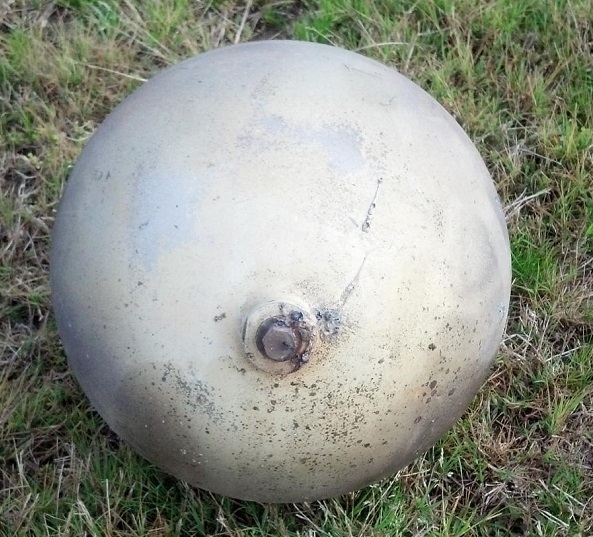 While strolling on the beach, they came across a two-and-a-half-meter diameter dome that would belong to the Space X rocket when the sea was at low tide, according to Huffington Post. 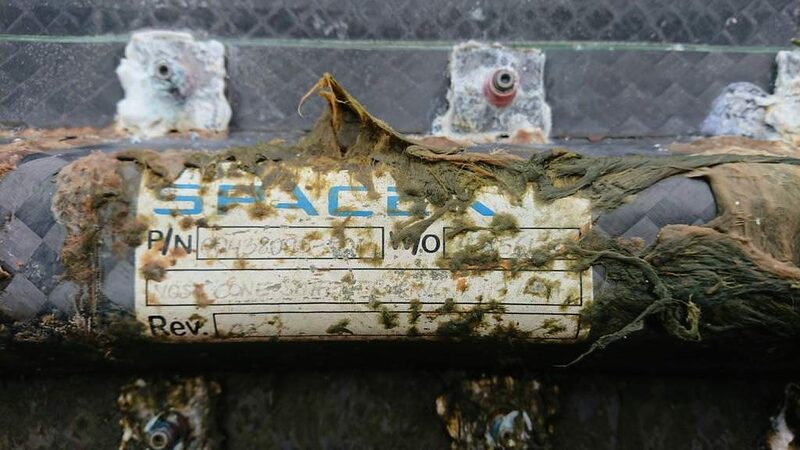 On photos shared on social networks by the Breton farm, we can read the inscription: “SpaceX”. While the farmers have contacted the agency directly, they explain that they have not yet received any answers from them. It took them four days to move the space debris that is now placed close to their home. Possible launch debris photos taken by Jennifer Schuster Jaeger. Photo of the front side by Ben Jaeger. 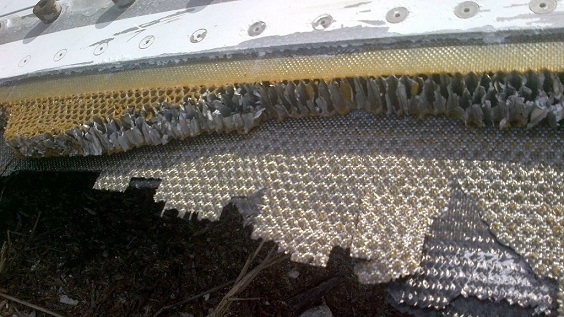 The object is described as follows: “The aluminum honeycomb is 1 1/8 inch thick sandwiched between two carbon fiber layers with a white composite outer shell. Foam insulation seemed to have been fabric covered though most of that was gone. 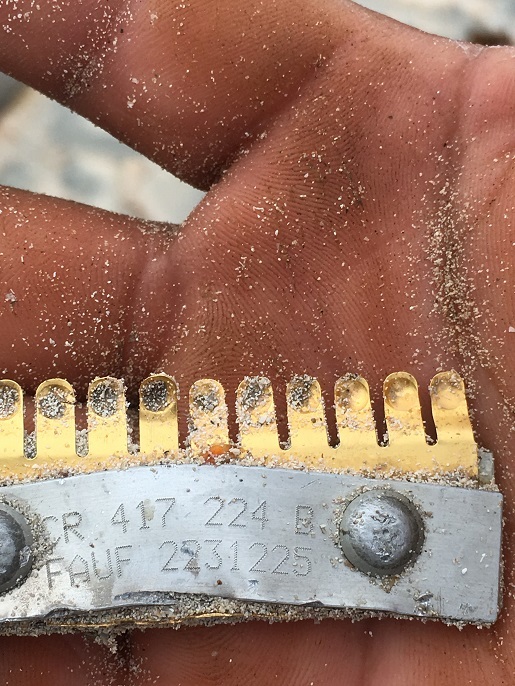 One edge of the piece appeared to be a plastic or composite seal attached with stainless pins going not around the circumference but longitudinally along the piece. 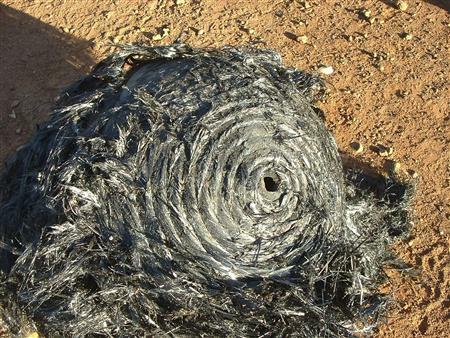 As of this past week, that piece of space debris is currently being used as a wind block wall in someone’s yard. ” It is important to know that the object appeared on the beach April 4 but was not there the previous day. Source: personal emails from Jennifer Schuster Jaeger, Richard Jaeger and Ben Jaeger April 9-10, 2018. 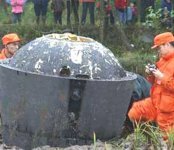 The Zenit upper stage from the Russian FREGAT launch reentered over Peru and a pressurant tank survived reentry and was found by locals. 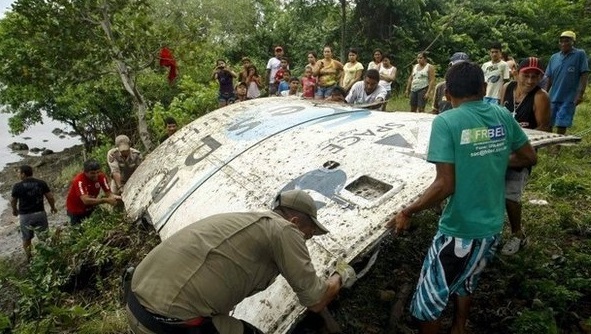 The object was observed as ‘tearing through the skies of the state of Acre and fell in an isolated area between Acre and the region of Pucallpa. 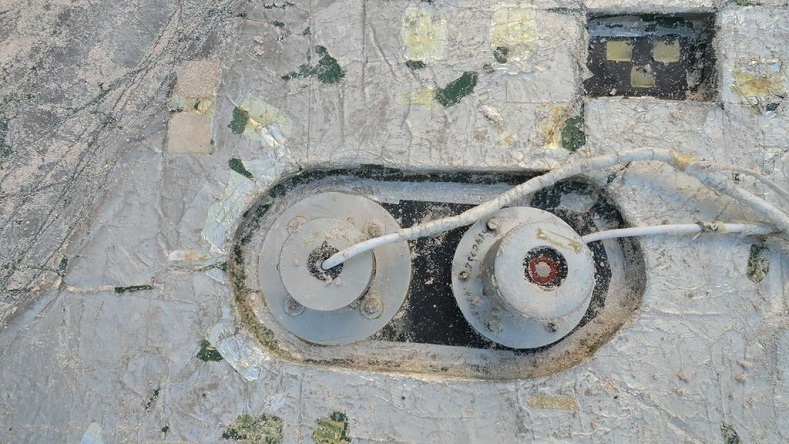 The images below are typical of pressurant tanks associated with the Zenit. 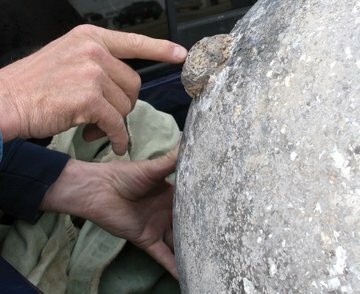 The object recovered weighted 40kg and was estimated to be 1.05m high and 2.7m in diameter (though from the images these are likely both not accurate). 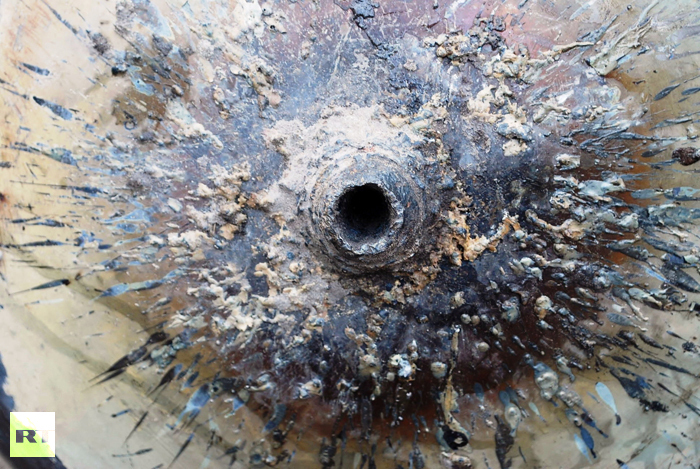 A crater located next to the object was 30cm deep and 29cm in diameter. “A booster from a Chinese Long March 3B rocket launch dropped from the sky and exploded near buildings in Guangxi, southwest China on Friday, shocking locals and onlookers.The Long March 3B lifted off from the Xichang Satellite Launch Centre in Sichuan Province at 07:18 local time on Friday, carrying two Beidou-3 GNSS satellites. 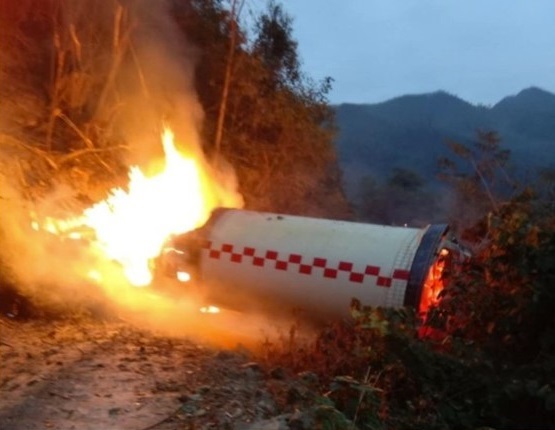 Minutes after launch as the rocket flew downrange, four strap-on boosters separated from the core, with one dropping near the town of Xiangdu in Tiandeng Country, Guangxi Zhuang Autonomous Region, around 700 kilometres from the launch site. With Tiandeng county being within the designated drop zones for debris for the launch, some locals were evidently ready to capture footage in the case that discarded rocket boosters fell from the sky. Photo from Horry County Police Dept. 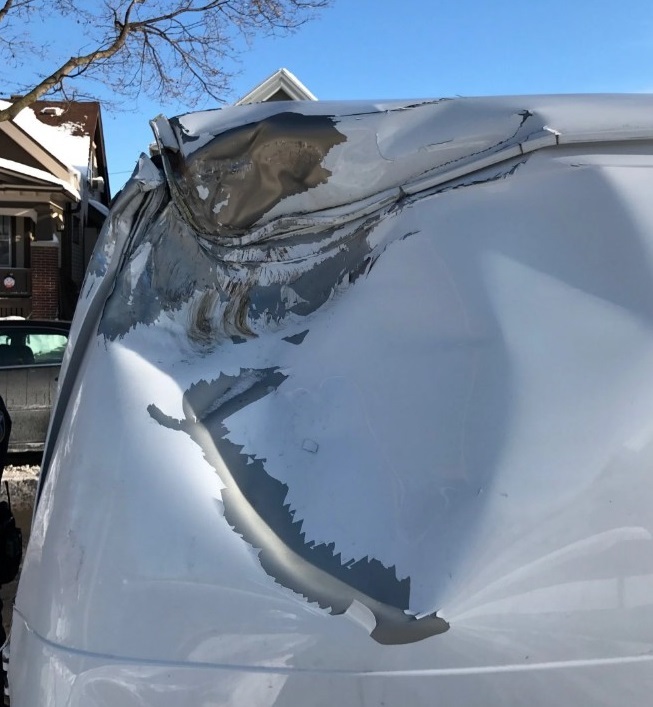 An object that appears to be similar to a COPV crashed into the back end of a white van sitting on a street in north Milwaukee, Wisconsin on December 20. A loud thump was heard but no other sonic phenomena or visual observations were noted in the area. The object fell into snow and does not appear to have significant damage to it. The van was grazed by the impact. No precise correlation with space debris is known as of this writing. 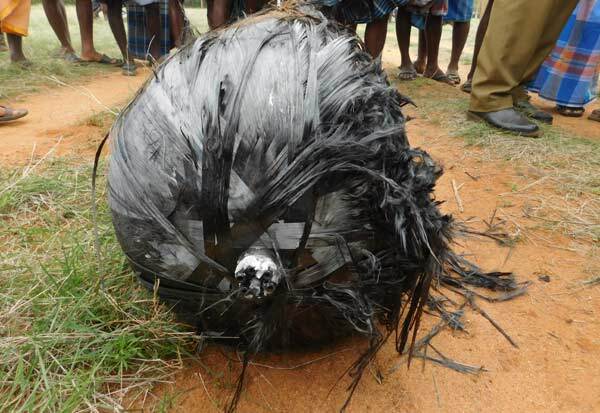 A composite overwrapped pressure vessel was found in Dindigul, India in late morning according to press accounts. The usual police, fire fighting and bomb squad were called in and in a video you can see officials cutting the overwrap revealing a dented metal component. No injuries or damage was reported. The part appears to be from the Vega rocket first stage. long and 1.2m wide. Another piece of metal with Chinese writing on it tore through the roof of a nearby house at about the same time, but no injuries were reported. It is thought it might be related to the launch of a Chinese satellite the same day. A loud bang, then smoke as local residents reported hearing a sound before the object landed. “We were all afraid of that explosion,” villager Ko Maung Myo told the Myanmar Times. “Initially, we thought it was a battle. The explosion made our houses shake. We saw the smoke from our village.” He said that the air near the object smelled acrid. 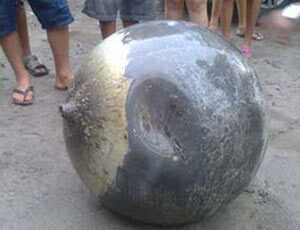 An apparent composite overwrapped pressure vessel was found on Madura island around 10pm local time. In the photo below you can see a cylinder 150cm long and 60cm in diameter with two rounded ends. 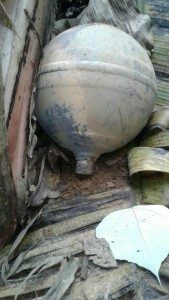 Pressure vessel found on Madura island. Landing next to a cowshed in the village of Sumenep there were no casualties as a result of the fall. The object is believed associated with NORAD catalog 41730–a Falcon 9 rocket body upper stage. 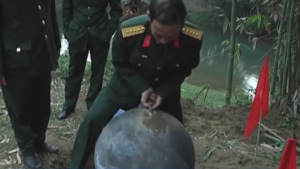 “Authorities in northern Vietnam remained stumped about a pair of “space balls” that fell from the sky this weekend. 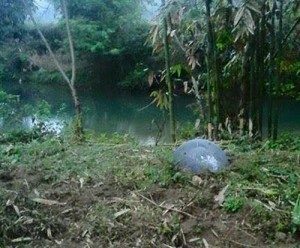 At around 6am last Saturday morning, a metal sphere 80 centimeters in diameter struck northern Tuyen Quang province, landing in a remote area near a stream, reports Thanh Nien. 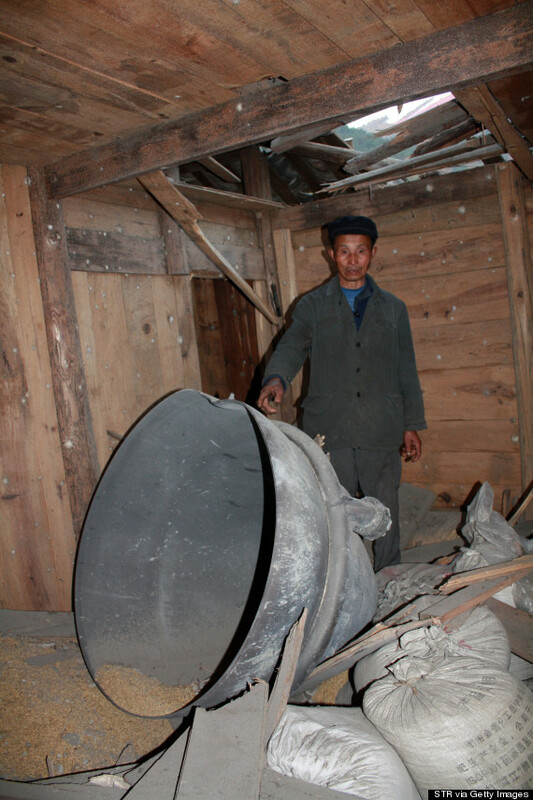 Shortly thereafter, another such object fell to Earth in neighboring Yen Bai province, hitting a garden. The second “space ball” was smaller, measuring roughly 27 centimeters in diameter, however similar in shape to the first. 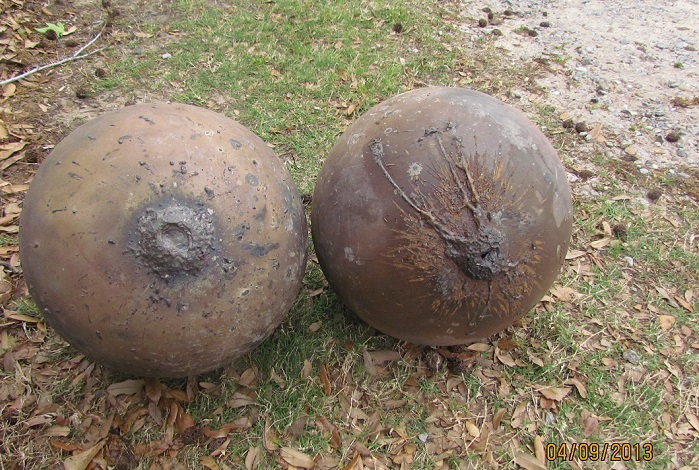 The spheres, weighing 250 grams, six kilos and 45 kilos, were found at three separate locations in the northern provinces of Yen Bai and Tuyen Quang last Saturday. They had reportedly fallen from space. 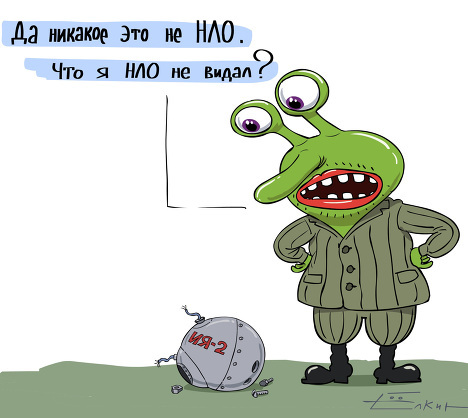 Initial investigations from the Ministry of Defense found that the objects could have been made in Russia and come from missiles or spaceships. They could have been used as compressed air equipment. 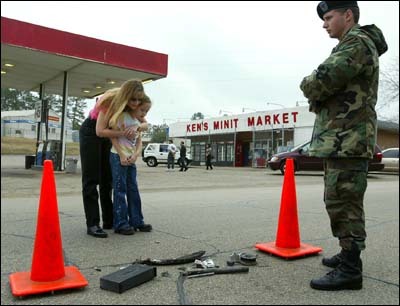 None of the objects were explosive devices, added officials. Authorities said they will report the incidents to the Council of National Defense and Security, adding that space debris must be dealt with properly to avoid possibilities of accidents. 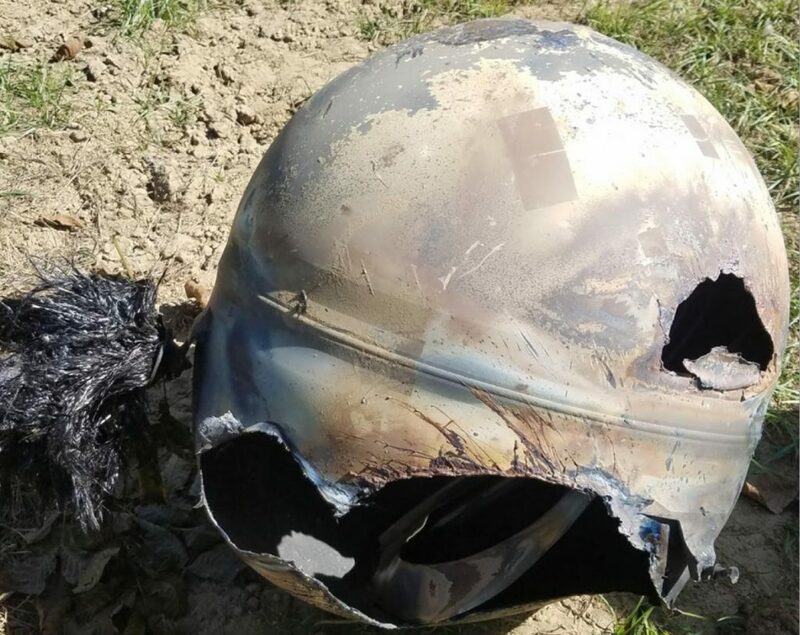 Witnesses said they saw the first sphere, around six kilos in weight, flying at around 6:30 a.m. before it crashed down on a house. 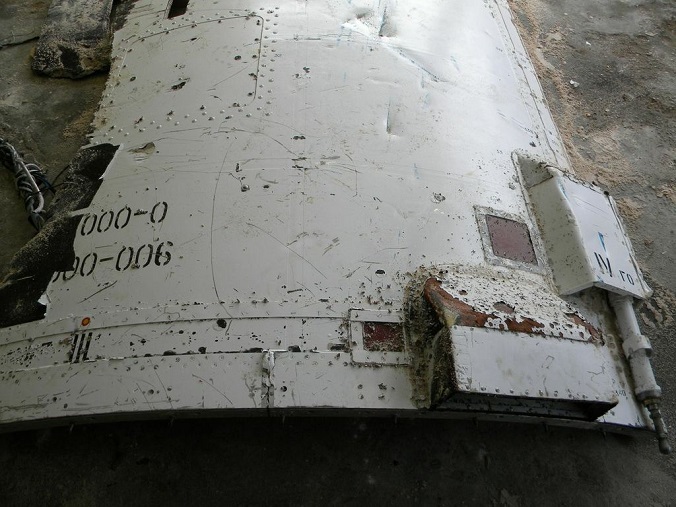 Analysis by Ted Molczan shows that the debris correlates well with the reentry of the Russian Zenit 2SB rocket (2015-074C) that was observed to decay over Thailand. 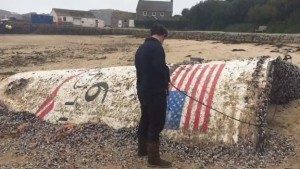 A large chunk of an American space rocket has been found in the sea off the Isles of Scilly. 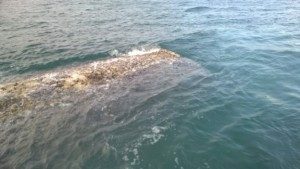 The section of the spacecraft, measuring about 10m (32ft) by 4m (13ft), was spotted on the surface between Bryher and Tresco. 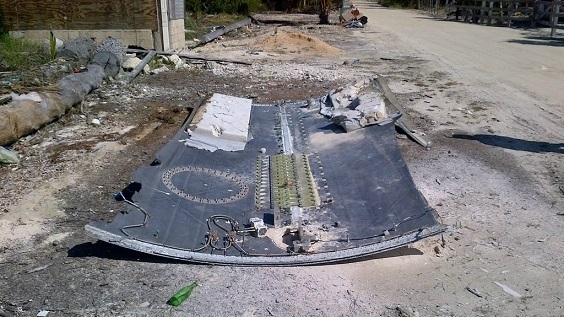 Coastguards believe it is from the unmanned SpaceX Falcon 9 which exploded after take-off in Florida in June. However many astronomers believe it is from a different mission due to the size and markings. 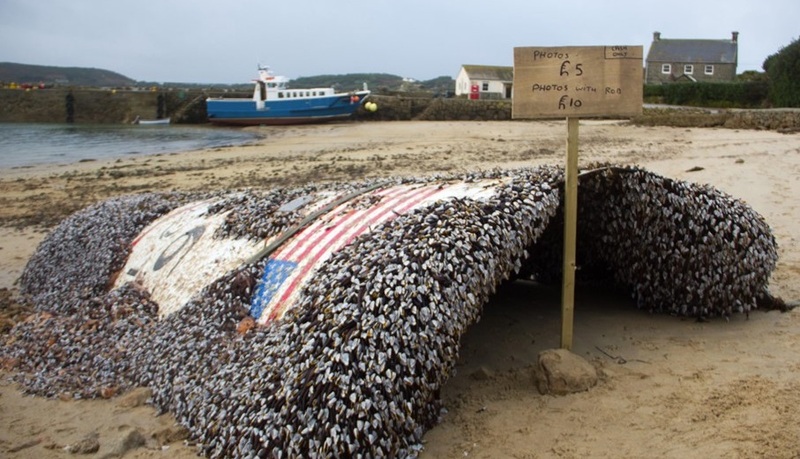 Local boatmen towed the section to Tresco where it has now been removed from the beach. 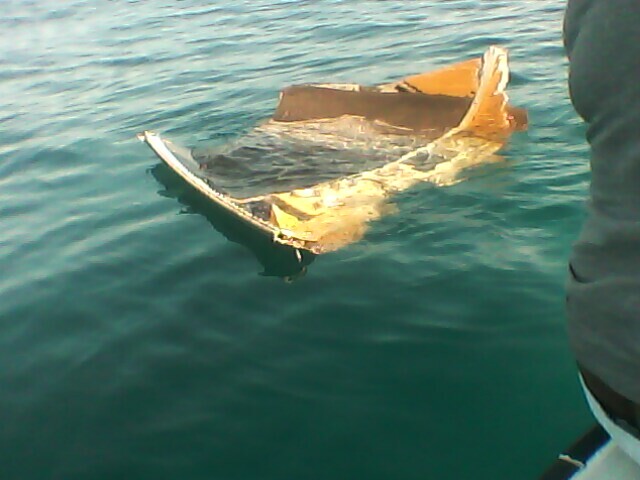 Coastguards issued a warning to shipping in the area after the discovery. Spokesman Martin Leslie said: “The markings show an American flag. It looks like it’s an American rocket and seems most likely to be the unmanned SpaceX Falcon 9 which blew up shortly after take-off from Cape Canaveral in June “We’re grateful for all those who helped in its recovery, it was a great example of the community working together.” That rocket, which broke up shortly after take-off and landed in the sea about 4,100 miles from the Isles of Scilly, was in the process of sending a cargo ship to the International Space Station. However Jonathan McDowell, an astronomer at the Harvard-Smithsonian Center for Astrophysics, said many experts believed, due to the size and markings which have now been revealed, it was from a different mission. “All the geeks have been getting together and looking at fine details, and we’re pretty sure it’s a launch from September 2014 that successfully sent a cargo mission to the space station. “It didn’t look like an exploded rocket to me, it looked like a fairly normal piece of space junk when the lower stage of a rocket falls from a hundred miles up and hits the ocean. Large sections can remain in tact and it’s really quite normal,” he said. Sphere 2 2015 Nov 08 Villa Vieja (Murcia) 38.25 N, 1.69 W 80 cm dia. ? 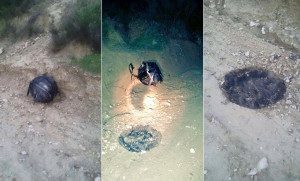 Metal Strip 2015 Nov 10 Las Barrancadas (Alicante) 38.47 N, 0.85 W 4 m X 0.2 m ? 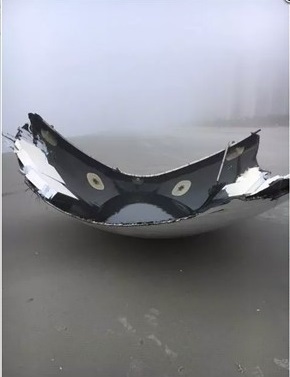 May 29, 2015 SPACE-X ROCKET LAUNCH DEBRIS A piece of a fairing from an apparent Space-X rocket launch with a S/N of 15 has been linked to the Deep Space Climate Observatory launch on Feb. 11, 2015. 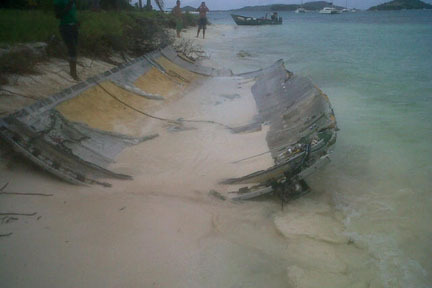 It washed up in the Bahamas on Elbow Cay on Great Abaco Island. This location is about 400km southeast of Cape Canaveral. 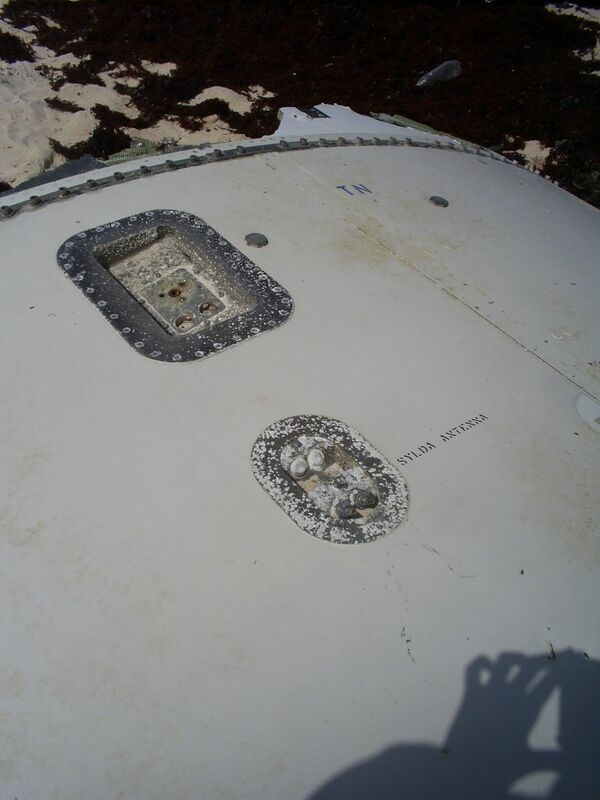 Three business executives who were on vacation in the Bahamas came across one of the two fairings that protect the payload. The fairings are supposed to separate about 4 minutes after liftoff. 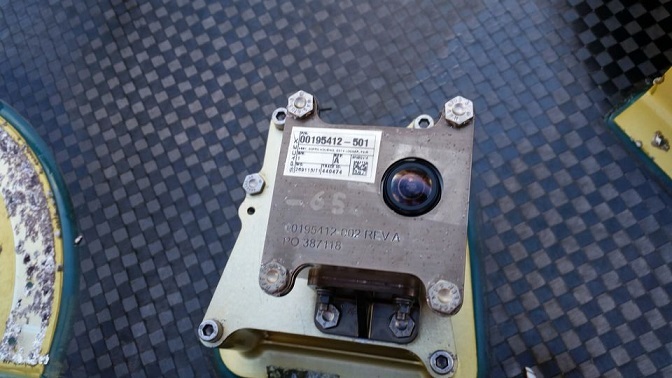 Attached was a GO PRO camera shown below; the fairings in place on the launch pad are seen in the next image. 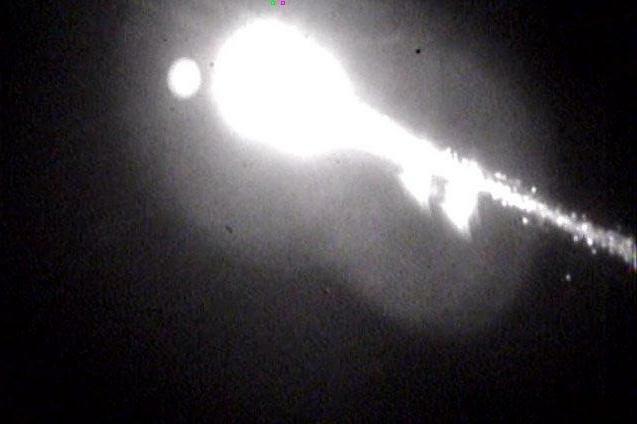 December 28, 2014 FALCON 9 ROCKET BODY 2014-52B After a flash in the sky, a roar, a scare and many doubts remained in Santa Rita do Pardo, 266 km from Campo Grande. In the city of seven thousand inhabitants, fireballs were seen this morning. 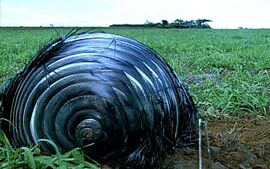 Then three consecutive bangs and an object, like a big truck tank, fell in the yard of Santa Maria. “It was 3 am and seven fireballs came from heaven,” says Marcelo Gulart, 44, supermarket owner in the city. 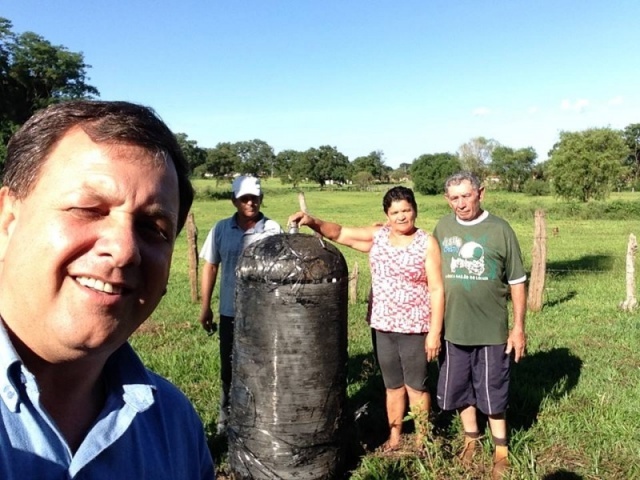 The farm owner’s friend, Marcelo says that the piece is 1.46 meters tall, 56cm in diameter, and weighs 30kg/66lb. 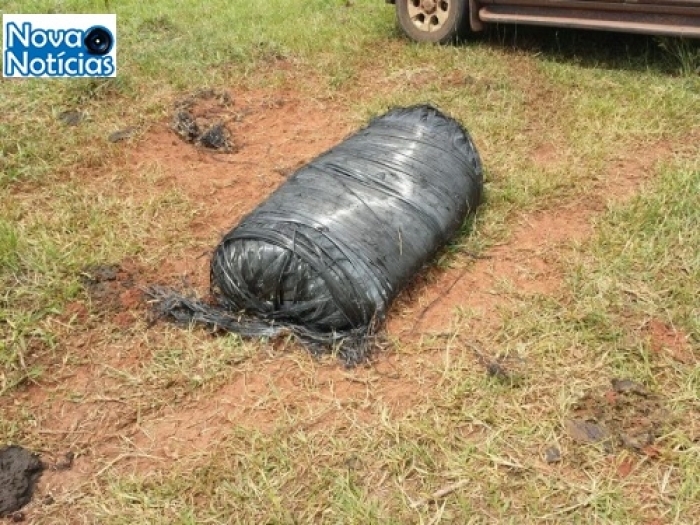 Carbonized, it fell 50 meters from Francisco Souza Dantas house, age 69. Early on Sunday, the place turned into a tourist attraction and pilgrimage point of curiousity to the mayor. With so much movement, Francisco is considering closing the gates. The lights were seen in the sky by residents of several cities such as Campo Grande, Antonio João and South Fatima, and similar reports in Paraná and Paraguay. 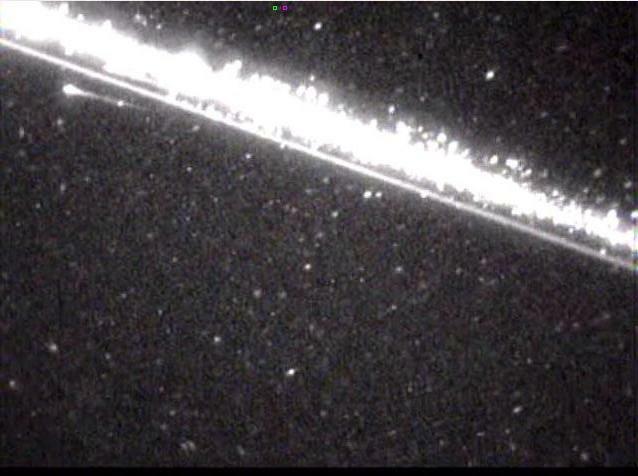 A number of videos were posted and they show the classic space debris reentry of a sizable piece of space junk, as opposed to a meteor.The photos here appear to show an intact carbon overwrapped pressure vessel. Joseph Remis correlates this with the Falcon 9 Rocket Body from the 2014-52 launch. 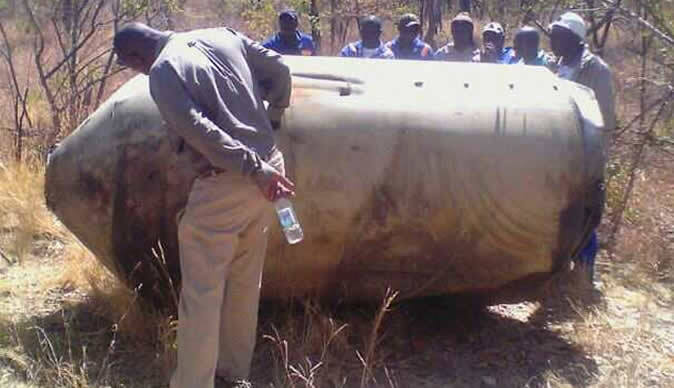 The object fell 15m from a house. It appeared to still have pressurant inside it. A second object was found near Andradina, about 160km east of where the first object was found. It is described as 20cm in diameter, 8cm in height, weighing 3kg/6.6 lb. It apparently hit a nearby roof as evidenced by the next image. On January 9, 2015 another object similar to the first one was discovered 30km away on a farm. The image is shown below. 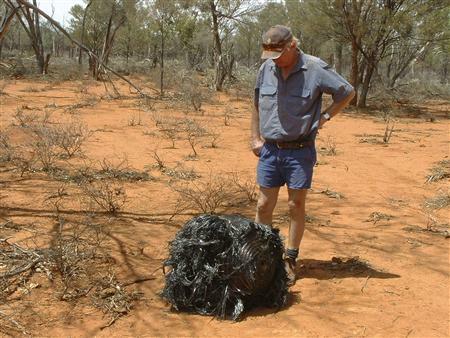 A man who believes he found a piece of space junk from the Russian rocket which spectacularly re-entered the atmosphere over Australia put it up for sale for $100,000. Last week’s fireball known as Object 40077 was the third stage of a Soyuz rocket which was launched from Kazakhstan on July 8. It plummeted to Earth at 29,000 kilometres per hour on Thursday night. Many people reported seeing a bright object travelling east to north about 9:45pm on Thursday. 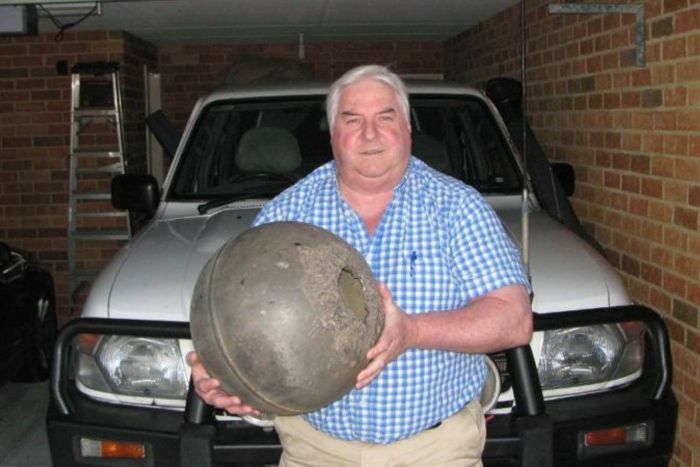 The man, known only as Peter, said he found the globe-shaped object just north of Walgett in New South Wales on Sunday. He believes the object is a fuel cell from a Russian rocket. He posted the object for sale on Gumtree but the ad has since been removed. Seller “Peter” believes the object is a fuel cell made of titanium and he hopes to get $100,000 for it. 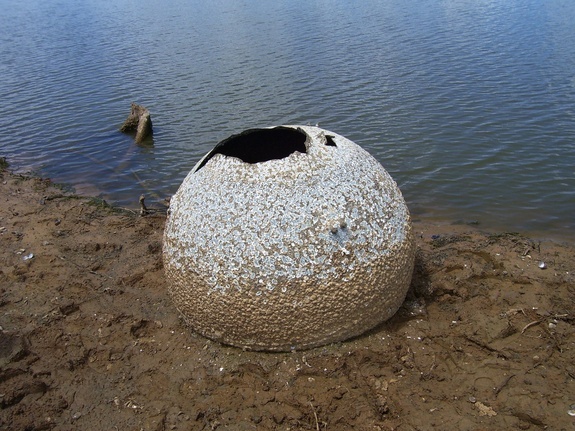 In the advertisement, Peter said the object was found on the Castlereagh Highway, under the Pagan Creek bridge. 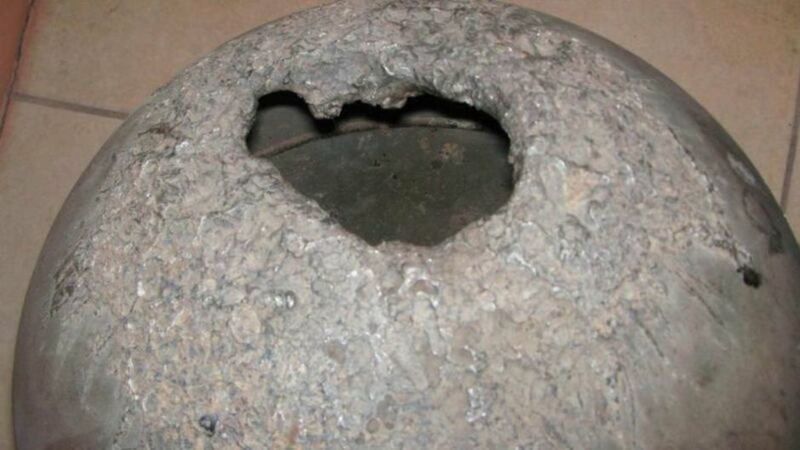 He said it was made of titanium, 40 centimetres in diameter and weighed 13.4 kilograms. “One of the valves is completely burnt off and has left some spectacular flow lines of melting titanium as it re-entered earth’s atmosphere,” Peter said in the Gumtree advertisement. 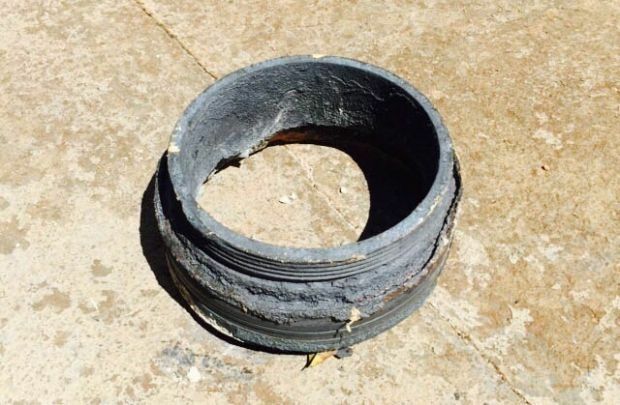 “The second valve is still partially intact.” The seller did not claim it definitely came from the space junk sighted over Australia last week but said “it certainly appears that way”. 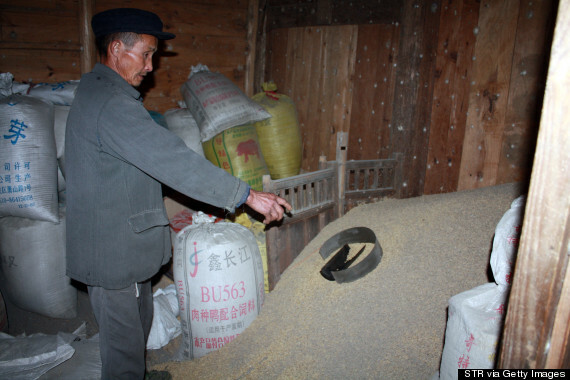 “Residents in the Heilongjiang province in China reported seeing three UFOs darting across the sky and apparently one of them came crashing down into in a man’s vegetable garden. 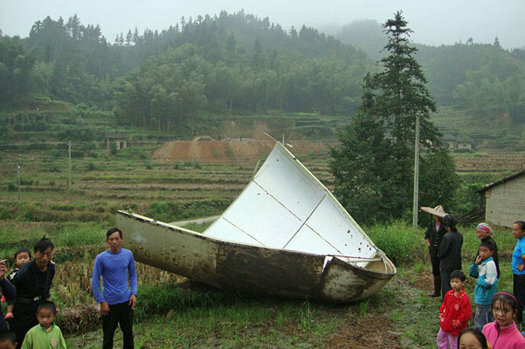 According to Chinanews.com, villagers in Mengchang saw three objects falling from the sky this morning. Soon after they heard a “huge piercing sound,” and a huge ball of flame came crashing down into the vegetable garden of one of the villagers. 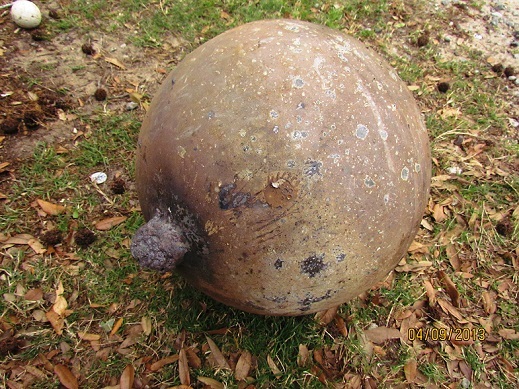 What they found in the garden looks straight out of a science-fiction movie. 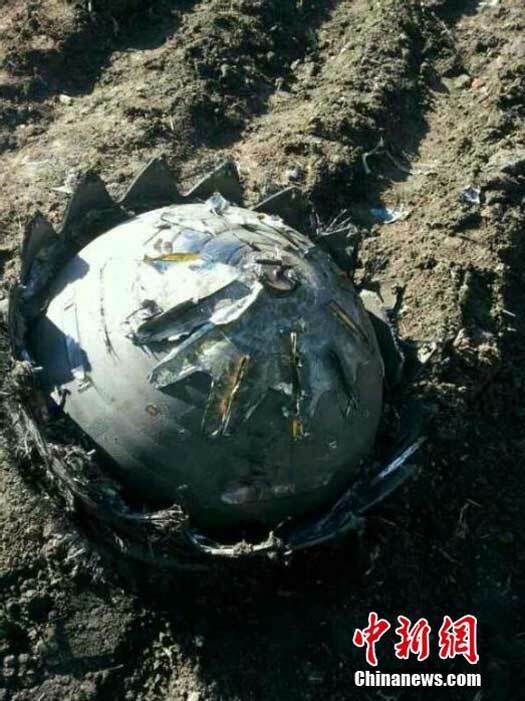 It appears to be a large metal ball covered by a layer of jagged material. According to China Radio International, China Central Television news is reporting the object to be about 2 and a half feet wide and weighing nearly 90 pounds. Residual nitrogen gas was found inside one object. Altogether, eight of these unidentified objects fell in the city of Qiqihar. 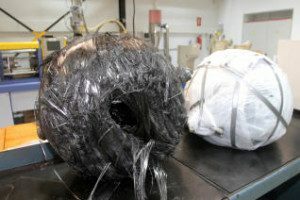 State-run media outlets reported that one of the balls was a little over 2 feet in diameter and weighed about 90 pounds. Locals saw the fiery balls falling. The area has been secured and an investigation is underway. 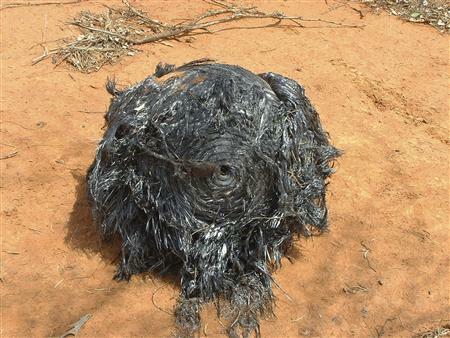 Villagers have taken pictures of the object, which remains unidentified. 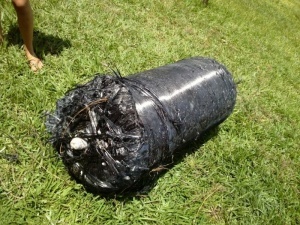 Chinanews.com has suggested that the object could be related to the failure of a Russian rocket at about the same time. The rocket launch was at 3:42 am local time in Kazakhstan, which is 5:42 am in Beijing. The rocket failed 540 seconds into the flight at an altitude of nearly 100 miles. The Proton-M rocket was carrying an advanced satellite. However, the head of the Russian national space agency, Roscosmos, told Russia Today the rocket and cargo burned up in the atmosphere and should not have caused any damage on the ground. The Heilongjiang province is a long distance from Kazakhstan, but the timing is coincidental. 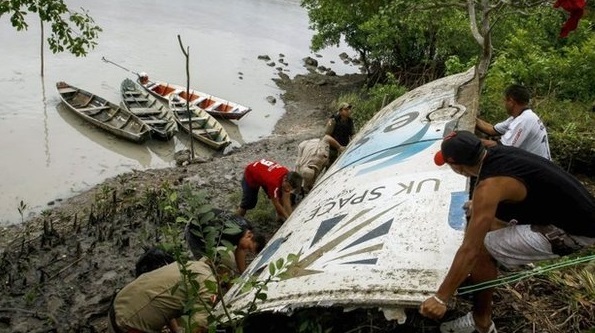 A fisherman in Brazil’s Amazon region has found a large piece of debris from a European space launch. 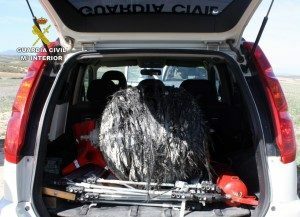 The man said he found the metal object floating on a remote river in the municipality of Salinopolis. 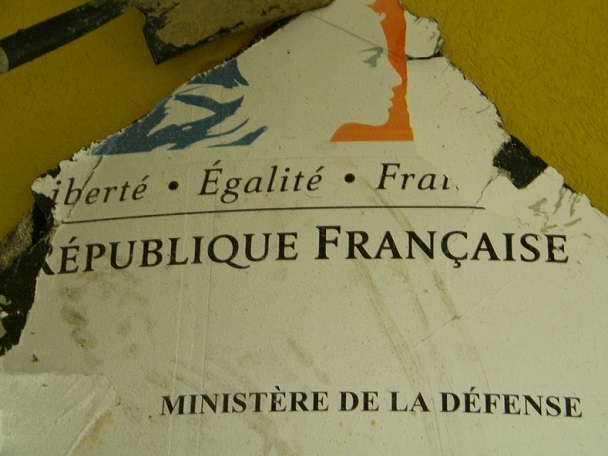 The debris has been confirmed as coming from a satellite launched from the Kourou base, in neighbouring French Guiana, last July. 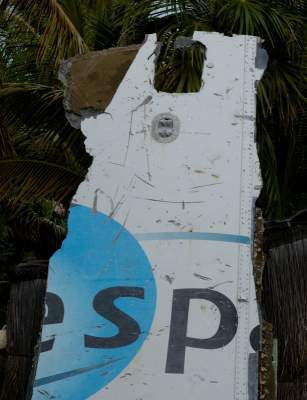 The piece bears the logo of the UK Space Agency and Arianespace – the European satellite company. 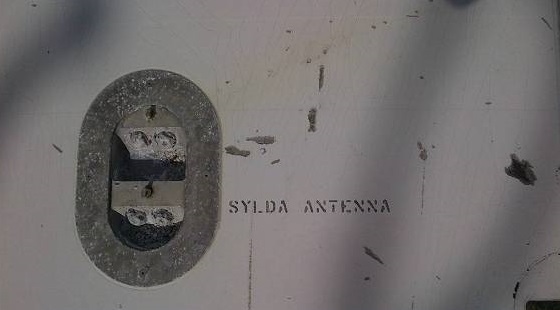 A spokeswoman for the UK Space Agency, Julia Short, confirmed that the debris was from the launch of Europe’s largest telecommunications satellite last year. Alphasat, described as Europe’s most sophisticated telecommunications satellite, was launched from the Kourou base on 25 July. Brazilian authorities in northern Para state said they would contact the UK Space Agency and ask them to collect the object. 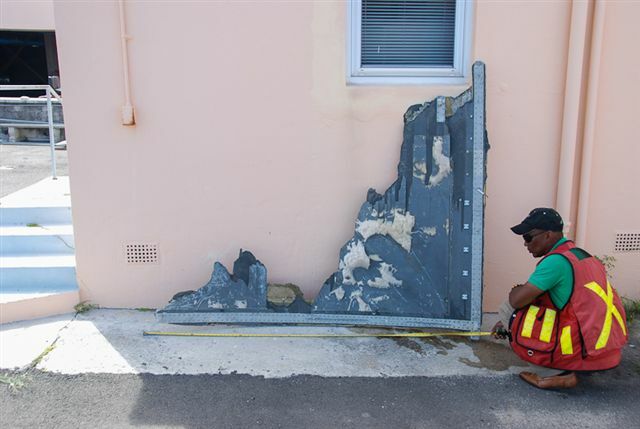 According to local reports, it took more than 10 people to retrieve the panel from the riverbank. “It is big, the size of a car,” local resident Gilson dos Santos told O Globo. Residents have been told to report immediately any symptoms of illness, but rescue teams do not believe the wreckage is radioactive. 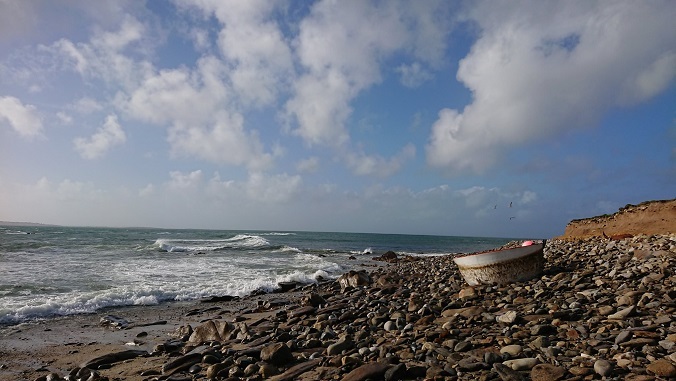 The local fisherman who came across the unusual catch – 73-year-old Manuel Alves dos Santos – said the authorities initially did not believe him. “It hit my fishing line and I pushed to the bank of the river to see what it was. It is the first time I see something like that,” he told O Liberal newspaper. 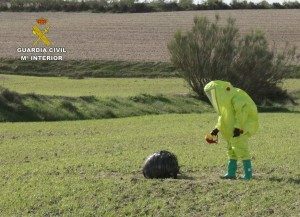 The object was found on Saturday night, but according to residents the authorities failed to respond to their initial calls. Recovery teams only arrived in the area after the finding was reported in the media. What appears to be debris from the Jack Rabbit launch fell and wrecked a couple of houses. 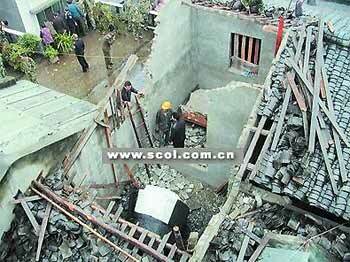 A resident told the Xiaoxiang Morning Post: “Three of the roof beams have crashed down on our house, and a big hole has been punched into our barn.” Another said: “The huge sound scared the living daylights out of me.” Authorities paid around £1,100 in compensation to those affected. Worryingly this is not the first time it has happened. 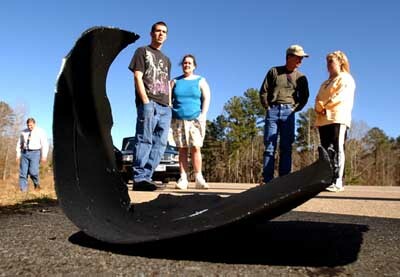 The county has been hit by debris nearly 20 times since the 1990s. The unmanned Chang’3 3 lander and the Yutu rover lifted off atop a Long March 3D rocket early on December 2. 2013, local time, from the Xichang launch centre in Sichuan province. 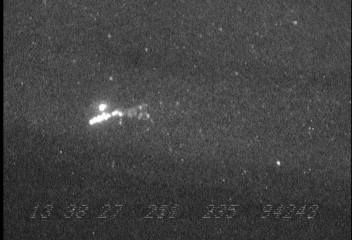 Objects were identified July 31, 2013 by Jonathan McDowell as part of the Symphonie 2 rocket launched on a Delta 2 vehicle. Launched August 27, 1975. 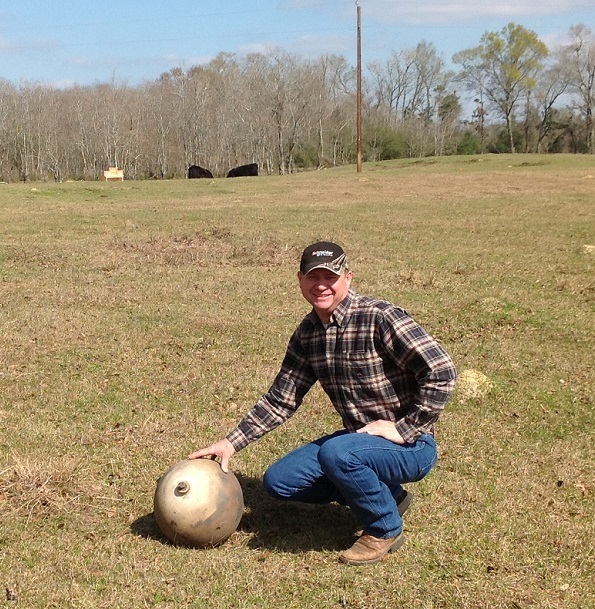 A titanium pressure sphere was found by Dean Gentz in Buna, TX USA on or before February 20, 2013. The sphere was spotted on his property near an oak tree and was sitting in place for some unknown period of time before it was noticed; therefore, the precise date of its appearance is not known. Due to the condition of the soil, there were numerous holes in the ground and there was no way to tell if it had landed and then rolled to its discovered location. 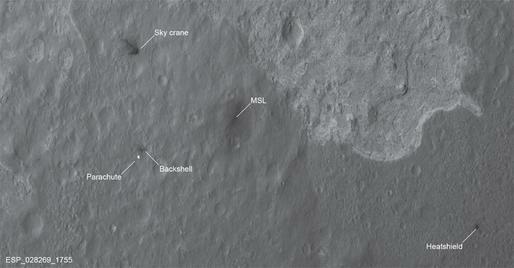 The sphere at its discovery location by Dean Gentz is shown in the above image. The sphere is similar in size, diameter, and circumference to that of the Namibia sphere of November 2011 described below, thus leading to the suggestion that it might be Russian in manufacture. There was no visual sighting of any kind. Mr. Gentz conducted a metallurgical analysis and determined the following composition: 91.25% titanium, 4.7% vanadium oxide, 2.05% silicon, .098% iron, .015% zinc, .013% molybdenum. The composition is consistent with titanium 6-4 based on the PMI (Powder Metallurgy International) machine analysis. 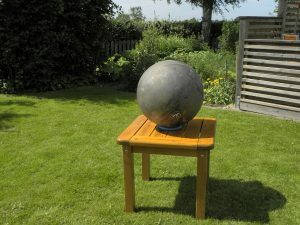 Weight of the sphere was found to be 16 lb (7.3 kg) and the circumference was 43.25 inches (17.02 cm), diameter 13.75 inches (5.41cm). 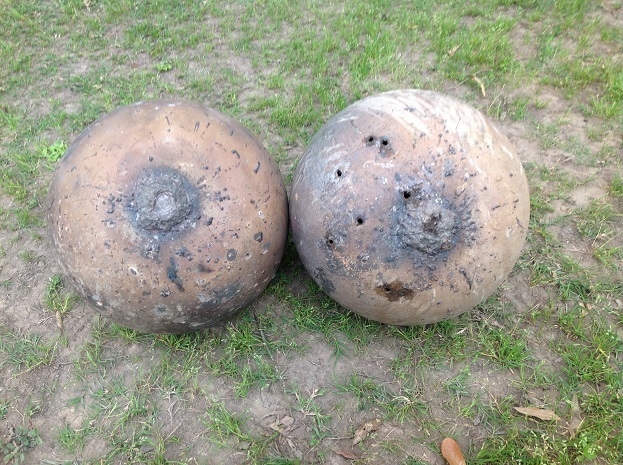 Photos of the Buna sphere show details of apparent ablation, burn marks, and pitting. There is a plug at both ends. The one shown above is melted. 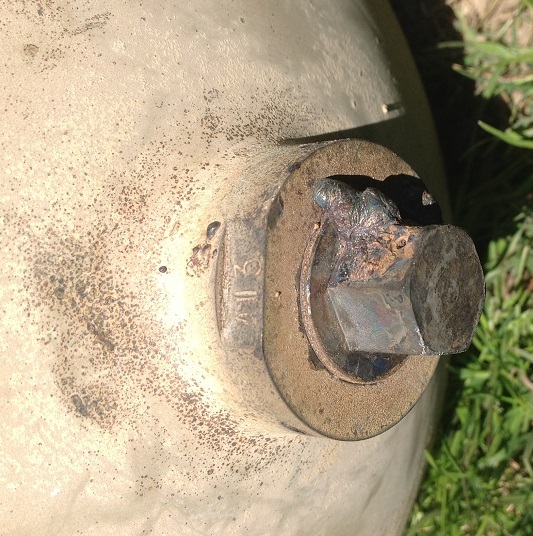 The photo above shows what appears to be a hexagonal nut with small safety wire holes. There are also what seems to be the numbers “413” engraved on the side. 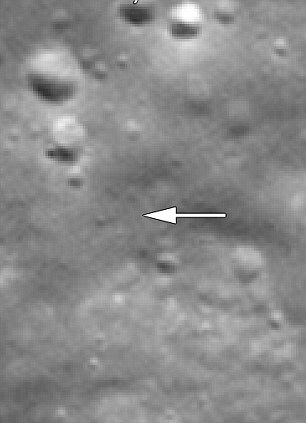 The image above shows the seam around the periphery of the sphere. All photos taken by Dean Gentz. The mystery surrounding this sphere became even more complex when a second sphere was discovered on March 10 about 1 mile (1.6km) from the first sphere. On March 6 a third sphere was found also close by and reported to me on March 19. Google Earth was used to identify the positions of all the spheres. In the course of this, the GE image was updated to February 28, the day after the decay of a possible reentry debris candidate 2012-021C. Sphere#3 may be that object located in the following image. Google Earth image possibly showing Sphere#3 and its shadow. On April 16, quite by accident a fourth sphere was reported about 1.5 miles (<3km) from sphere#1. The spheres have these aspects in common: all were found within 2 miles of one another, all are made of titanium, all have a welded equatorial band, all have the same diameter and circumference as well as empty weight, all show ‘signs’ of possible ablation, all (except for sphere#1) show no markings, all have two ‘plugs’ at opposite ends where one plug appears melted, the other is a 6-sided nut that appeared more or less intact. One space debris candidate suggested is the CZ-4B Chinese 3rd stage rocket (2012-21C) which reentered over the area on February 27. However, the discovery date of sphere#1 conflicts with that date. 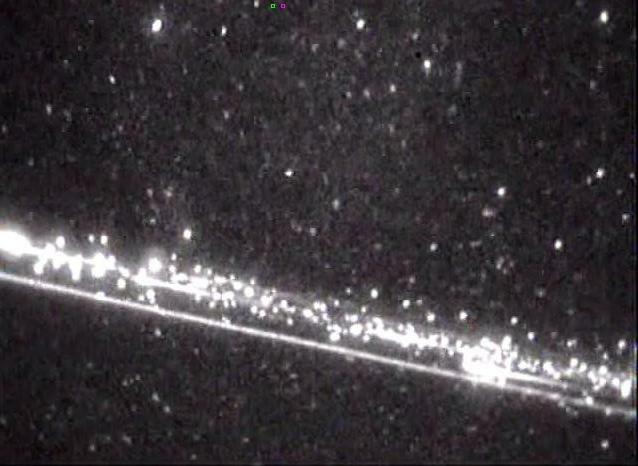 The evidence of space debris is intriguing but circumstantial. As of April 26, the investigation continues. 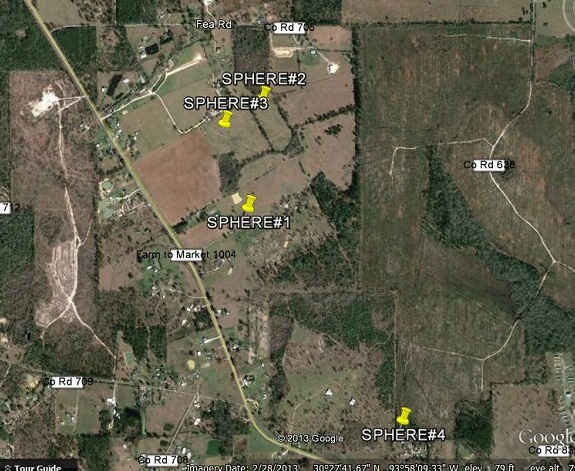 Google Earth map showing the approximate locations of the 4 Buna, TX spheres. Paul Maley and spheres 1, 2, and 4 (left to right), in order of their discovery. Sphere 3 was not available at the time. There is uncertainty in the reporting timeline due to the source of the online description being a blog. 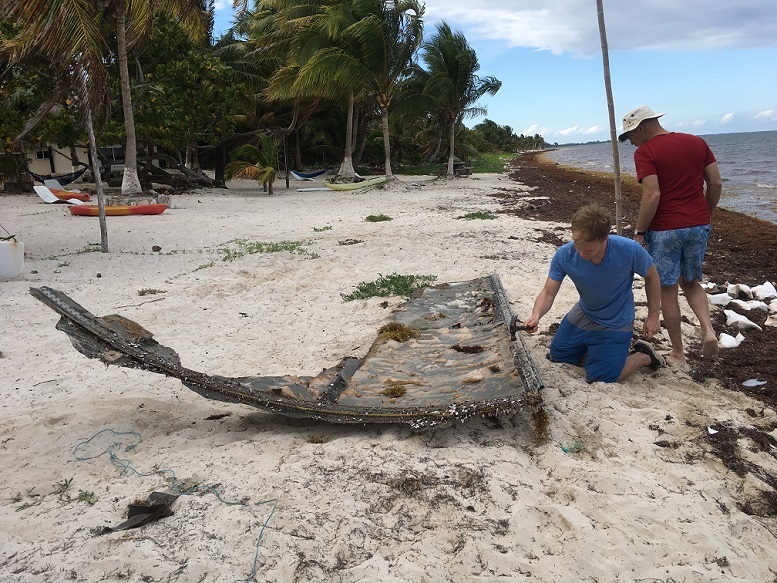 However, parts of an Ariane rocket payload fairing appear to have been carried by currents to the shores of Mexico where it washed up on the beach” in Mahahual, 400km south of Cancun, Mexico, close to the border with Belize. [See a similar account below November 4, 2009. ] It is about 2cm thick, and several meters long. It appears to have a Kevlar covering over an aluminum body made up of thousands of wafers, like a heat sink.” according to the description. Apparent location of the panel in the assembly bay and during launch. Additional identifying markings which may be important in linking specific parts to a launch. After further investigation it was learned that the identity of the Soyuz ST VS04 launch could be derived from one of the panels as in the next image. 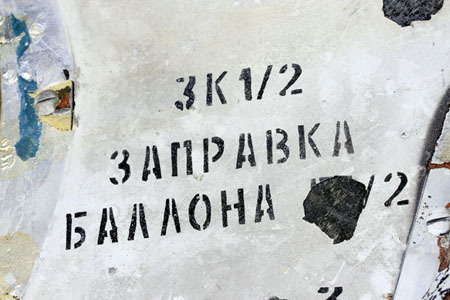 A key piece of evidence to linking a piece of Soyuz ST VS04 launch debris is in the lettering. 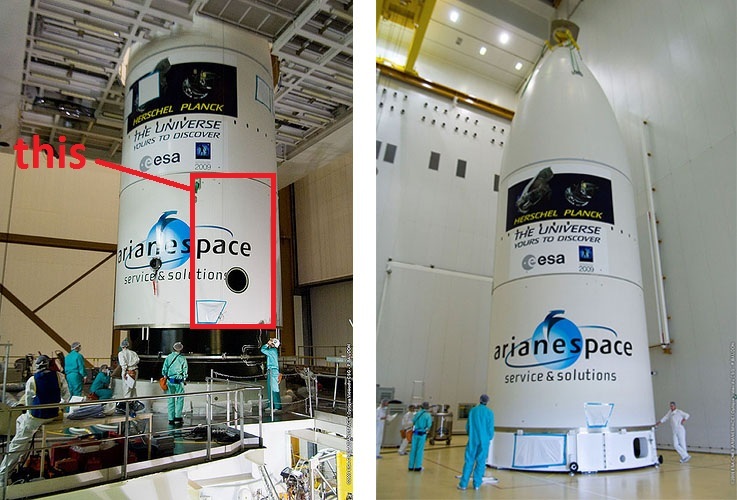 The above letters “de” reveal that this payload fairing was associated with Soyuz ST VS 04 (carrying the Pléiades 1B satellite) launched on December 1, 2012. 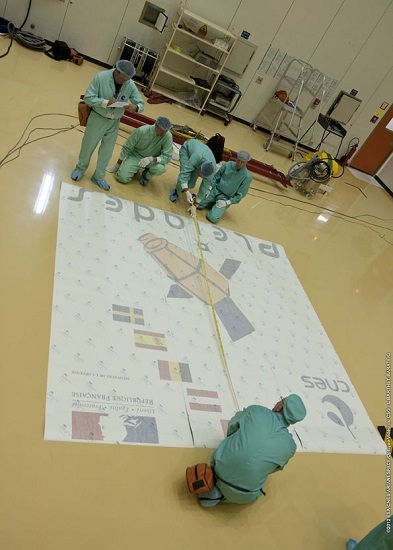 The PLEIADES decal being applied in the clean room prior to launch. Two probes released from the Grail spacecraft orbiting the moon in 2012 were called Ebb and Flow. Ebb and Flow deliberately plunged into a lunar mountain in December after mapping the moon’s gravity field in unprecedented detail. The location was chosen because it was far away from the Apollo landings and other historic sites. 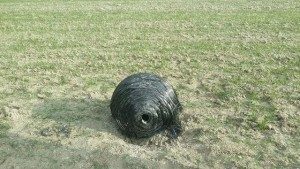 This piece of debris, found recently in a Rooks County (Kansas) farm field, is a piece of space junk from a Russian rocket. Holding the space junk is Doug Wereb, a former space science educator at the Kansas Cosmosphere & Space Center in Hutchinson, who said the debris is part of the fourth stage of a Russian proton rocket that was launched Friday, Oct. 13 from Kazakstan. The National Aeronautics and Space Administration said the show on Friday, Oct. 13, was the fourth stage of a Russian proton rocket launched that day from Kazakstan. And Doug Wereb, an adjunct faculty member at Butler and Cowley County community colleges, says Rush County farmer Craig Rixon found fragments of the Russian rocket. Goddard Space Flight Center’s Networks and Mission Services confirmed the launch and decay of the satellite late Tuesday. 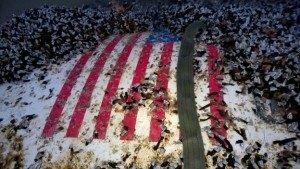 Wereb, who is a former space science educator at the Kansas Cosmosphere & Space Center in Hutchinson, was called on to identify the space junk. Rixon said he saw the pieces in the sky, but didn’t have any idea where they fell until days later. “I was out fixing fence and stumbled across it,” he said. “It was in a place you couldn’t drive with the pickup.” He said the fragments caught his attention because they looked so unusual. “It didn’t look like it should be there,” he said. “I thought it might have been part of what flew over. That was the first thing that crossed my mind.” Rixon called Rush County Sheriff Jack Mendenhall, who had seen the sky light up while at a high school football game in La Crosse. “Everybody in the stadium saw it,” Mendenhall said of the phenomenon that lit up the sky. “Pieces of it flared off to the sides like a Roman candle.” Mendenhall thought it was an aircraft dropping flares, but as it passed overhead, he saw a big smoke trail. “I had no idea what it was,” he said. “What convinced me that it was something burning up was the smoke trail. You could see it burning, and it was bright.” After Mendenhall got Rixon’s call, he shipped the sample to Wereb, who has identified many meteorites, and astronomy teacher Rob Kuhn, director of the McConnell Air Force Base branch of Butler County Community College. Wereb said the largest piece recovered was about a foot-and-a-half long and 8 inches wide. A second piece was 10 inches long and about 6 inches wide. Numerous small fragments were scattered on the ground. Wereb identified the space junk by its appearance and odor. “It looks like a burnt-up rocket casing, it smells like a burnt-up casing, and it was found where one came down,” he said. But, Wereb said, the pieces found in Rush County are just a small part of the 10- by 14-foot rocket. Most of it burned up in the sky, Wereb said. 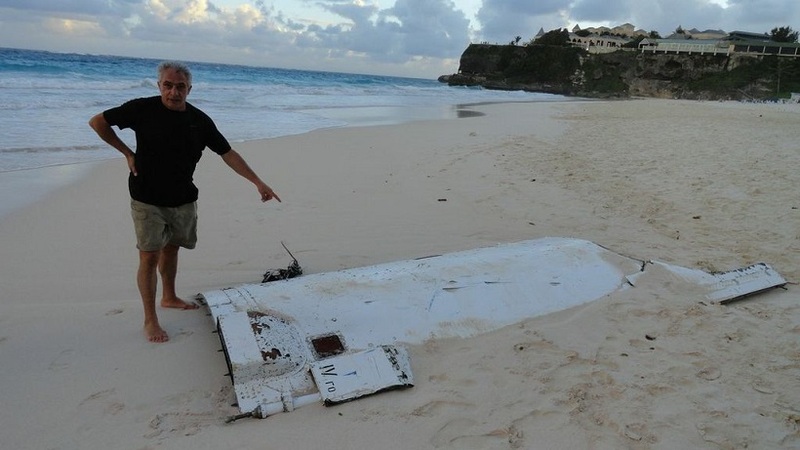 “An object washed up on Angle Beach, Southampton, Bermuda on 26 August 2012. It came to the attention of the Bermuda Department of Civil Aviation and has been identified by the Office of Space and Advanced Technology of the Department of State of the United States of America as belonging to the United Launch Alliance. 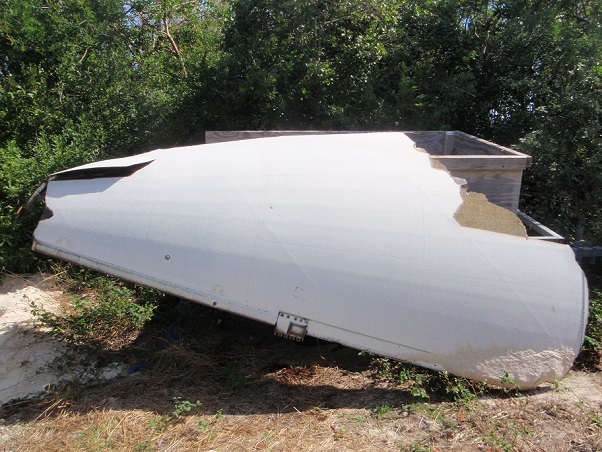 It is believed to be part of a payload fairing from an Atlas V mission conducted on 4 May 2012. In a related report sent to me on April 30, 2015, Alex Davidson reported that he came across a part of a fairing at around August 1 or 2, 2012 located 4 miles southwest of Bermuda. The image is shown above and may or may not be directly related to this launch. 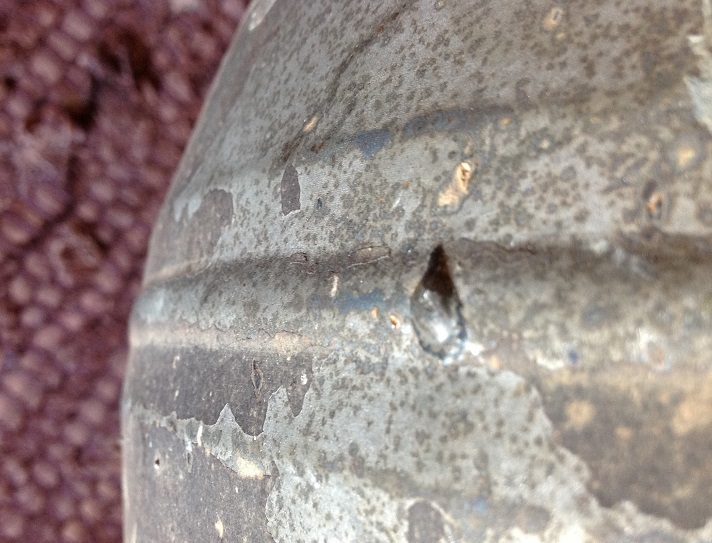 There are clear markings along the edge of the piece as shown in the image below. Mr. Davidson reports that the part was in fairly good condition with slime but no heavy barnacle growth indicating it had not been in the water for an extended period of time (e.g. years). He had a group of students and had cut his foot on the piece of debris but had the presence of mind to take photos. NASA’s Mars rover Curiosity was a bit of a litter bug as it wrapped up its 352-million mile (566-million kilometer) journey early Monday and headed toward a landing inside Gale Crater, an ancient impact basin that is home to a towering mound of sedimentary rock. From a vantage point about 186 miles (300 kilometers) above the planet, Mars Reconnaissance Orbiter, known by its acronym MRO, surveyed the scene, providing documentation (in case NASA ever faces littering charges) of Curiosity’s discarded heat shield, parachute and sky crane. Various debris components from the Mars rover mission. 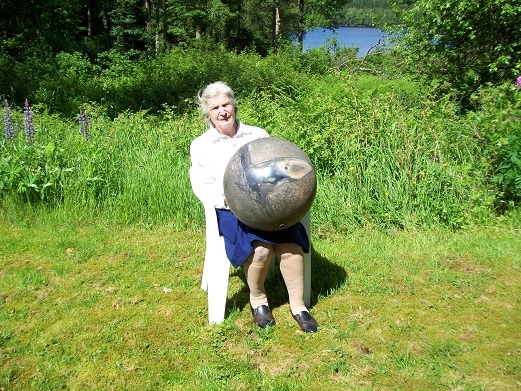 I received an account from the 1970s that describes a metal sphere that landed in Sweden. Source: Rolf Arvidsson. 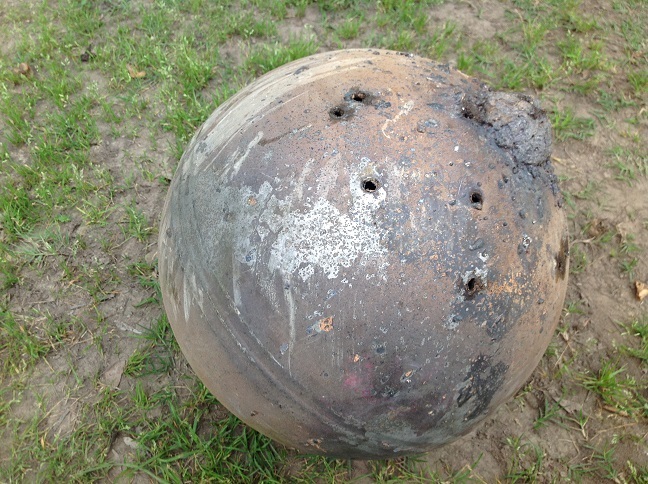 Mr. Arvidsson reports: “The metal “ball” was found in the early 1970’s (?) by Forest Officer Poul Neergaard-Petersen (1923-2003) in a remote bog some 5-7 km SW of Torup in south western Sweden. He brought it home and it was placed as a garden decoration. He and his wife Karen thought it was dropped from the bomber streams (RAF and USAAF) on their way to Germany during WW2. The sphere in the hands of its current owner. R.Arvidsson photo. 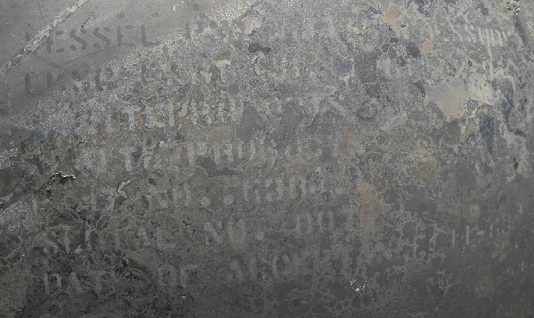 English text on the sphere. T.Fagerstrom photo. 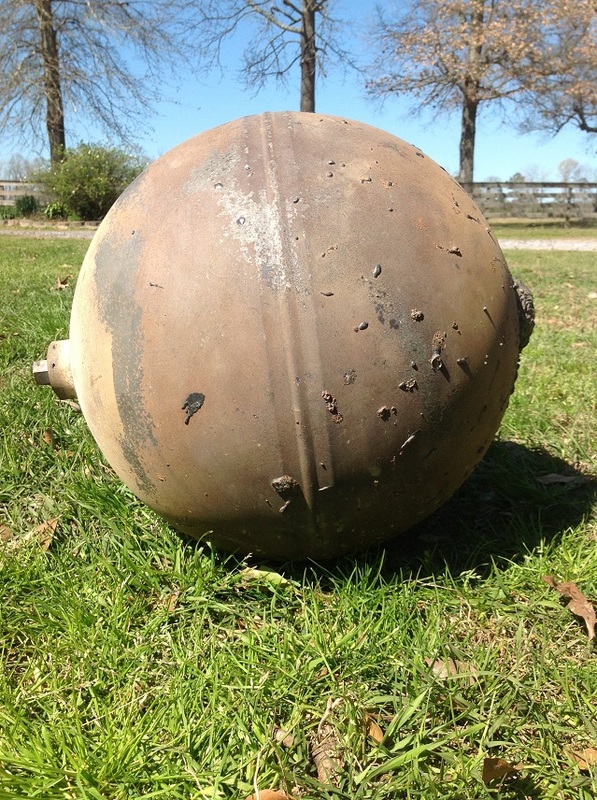 Given the ablative appearance on parts of the sphere and the writing, the NASA Johnson Space Center Orbital Debris Office suggests that this object is likely a GN2 tank from an Agena rocket stage. Identification with a particular space mission is unknown. 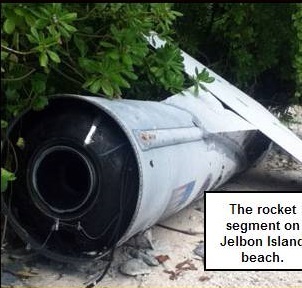 The following is a description of rocket debris found on shore in the Republic of the Marhsall Islands (referred to below as RMI). 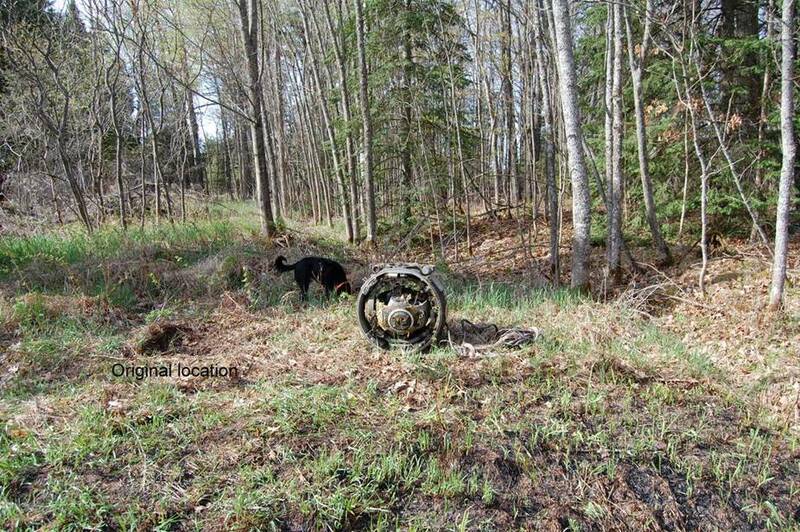 A piece of what possibly might be part of a Russian ICBM launched from Baikonour fell on December 27, 2011 near Kuybyshev in Siberia. 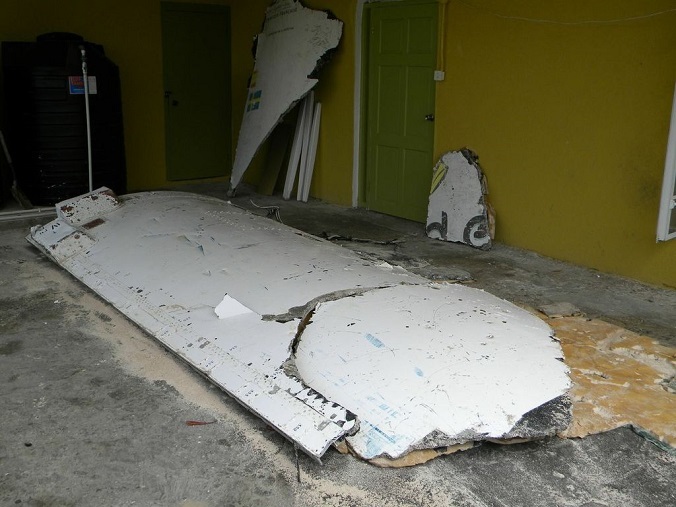 The debris piece weighed 200kg and was measured as 2m in height; it hit the roof of a house. 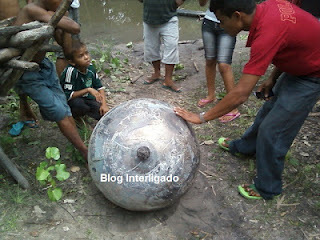 On February 22, 2012 a spherical object (titanium sphere) fell from the sky this morning in the city of Anapurus-MA Brazil, 28km away from the town of Chapadinha. The fall of the object, so far unidentified occurred around 06:00 this morning in the village wells, property of Mr. “Iron Leg”. According to the information after a crash that looked like lightning or thunder, the mysterious object came to the floor. With spherical object about the size of a cylinder of cooking gas. The object hit a tree before rolling to the ground. It is believed the source of the sphere is from the reentry of the Ariane 44L rocket body, also known as 1997-16C. 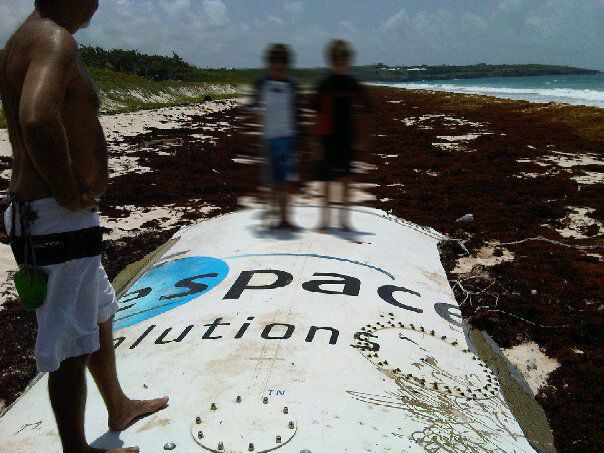 “More news about the the space rocket debris washed up on the Delphi Club beach, Abaco. 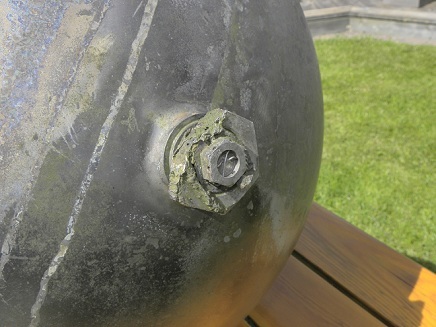 The booster rocket fairing found by Sandy fortunately had a serial number on it. Various inquiries have been made and a definitive explanation of the item has now been given by the NTSB. 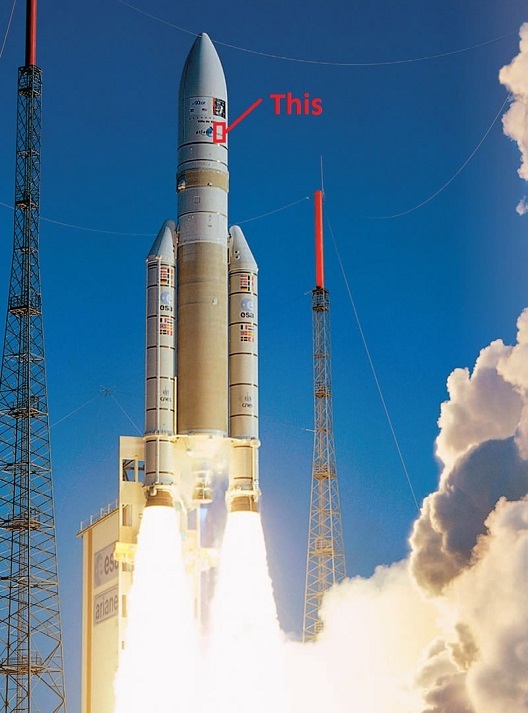 It turns out that the fairing was not, after all, from the Ariane 5 launch in French Guiana. 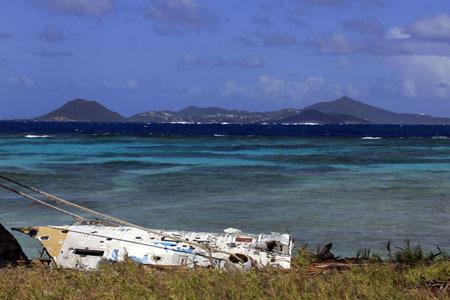 More exciting than that – it comes from a Mars Program launch to put the Space Rover Curiosity on Mars.” Abaco Islands are a group of islands in the northern part of the Bahamas. Size of the debris piece is approximately 12 feet. Part of an Atlas V nose cone. A Siberian homeowner who miraculously escaped serious injury when a fragment of a Russian communication satellite crashed through the roof of his house had to fix it himself as the authorities wrangle over compensation.A $500-million Meridian satellite that was launched on Friday from the Plesetsk space center in northern Russia on board a Soyuz-2 carrier rocket crashed near the Siberian city of Tobolsk minutes after liftoff.More than 10 satellite fragments were found in an area some 100 kilometers from the city of Novosibirsk.One, a titanium ball of about five kilograms, crashed through the roof of the single-family home in the Ordyn district.The homeowner, Andrei Krivorukov, had gone out to the yard to fetch firewood minutes before impact.The village administration promised to do repairs at its own expense but did not.Novosibirsk Region Governor Vasily Yurchenko said on Tuesday the compensation should be paid by the Federal Space Agency Roscosmos whose satellite and booster rocket had caused the damage.”The entire damage caused by the fall of spacecraft fragments on residential buildings and social infrastructure should be paid by Roscosmos. It is an independent economic entity,” he said.Tired of waiting in subzero temperatures, Krivorukov had to fix the roof himself.Meridian-series communication satellites are used for both civilian and military purposes. According to initial reports, the remnants of the spacecraft were expected to crash near Tobolsk in the Tyumen Region of Russia. 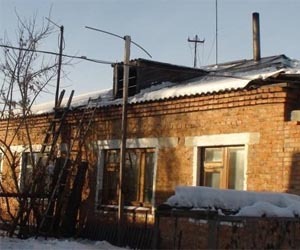 However within three hours after the accident, Interfax news agency reported that fragments of the spacecraft were found near Ordynskoe in Novosibirsk Region.Soon, a report came that a fragment from the failed mission crashed into the residential house in the village of Vagaitsevo, some three kilometers from the Ordynskoe regional center in Novosibirsk Region. 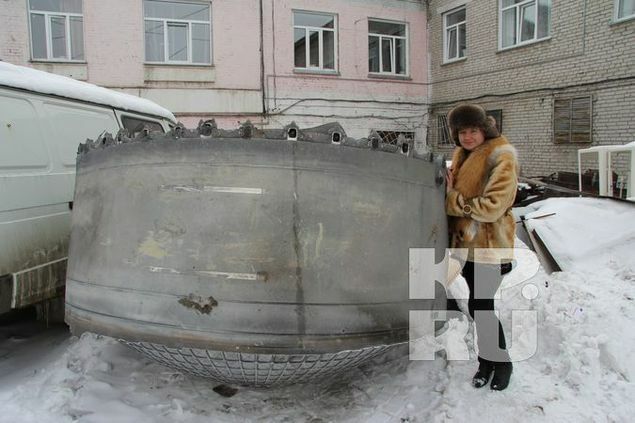 Ironically, what was described as a 50-centimeter spherical gas tank hit the roof of the house along Cosmonauts Street. 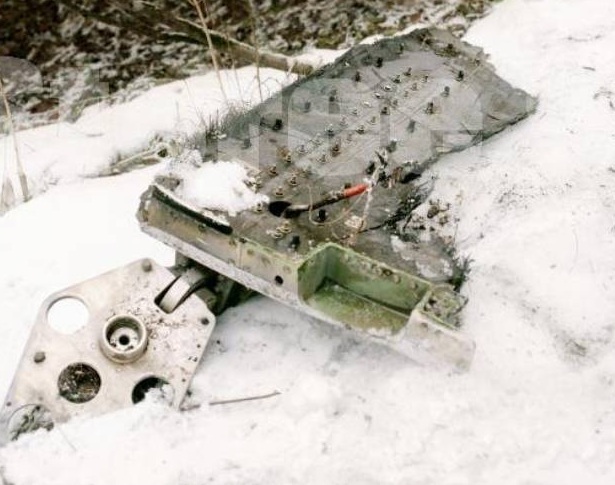 Fortunately, nobody was hurt in the incident, Russian media said.By the end of December 2011, a total of 13 recovered fragments from the Meridian launch accident were reported in the Novosibirsk region and three additional pieces were discovered in the area by January 6, 2012, RIA Novosti reported. Fragments were found in Ordynsky and Chulymsky districts of the Novosibirsk Region. 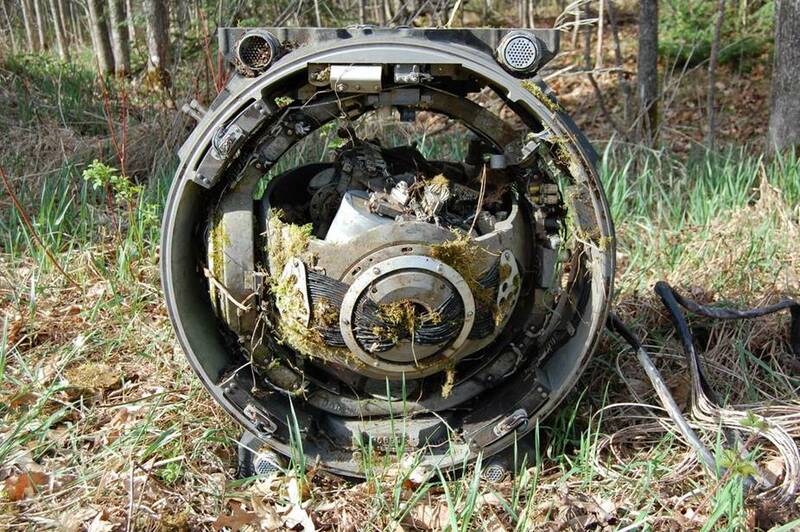 On December 26, 2011, local hunters found two 1.5-meter tanks in the woods. 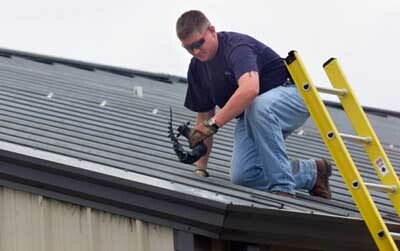 Photo above shows the roof of the house after repair. 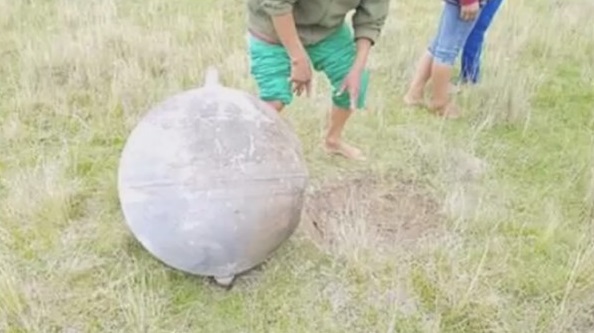 A large metallic ball fell out of the sky on a remote grassland in Namibia, prompting baffled authorities to contact NASA and the European space agency. 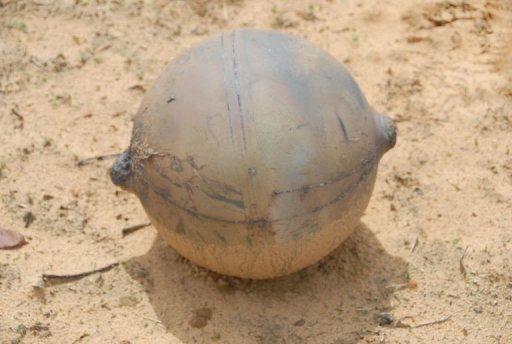 The hollow ball with a circumference of 1.1 metres (43 inches) was found near a village in the north of the country some 750 kilometres (480 miles) from the capital Windhoek, according to police forensics director Paul Ludik. Locals had heard several small explosions a few days beforehand, he said. 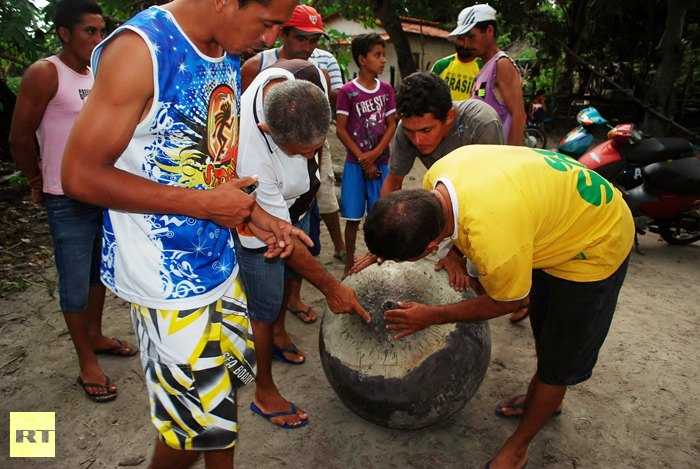 The sphere fell on Wednesday in a village of Riacho dos Poços in Brazilian Maranhão state. No casualties were reported apart from an unfortunate cashew tree that was severed by the object as it plunged to the ground, according to MR Notícias, a Mata Roma news site. 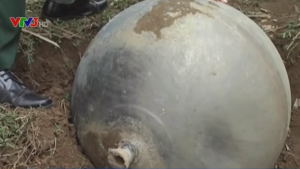 Valdir José Mendes, 46, told police the sphere landed several meters from his house leaving a one-meter-deep hole in the yard. “I heard the noise and I went out to see what caused it. I thought it was a plane that had fallen, or an earthquake,” he said. The noise was such that Mendes was too scared to go outside. However, curiosity got the better of him and he headed outside to find the cashew tree’s trunk snapped in half by a mysterious metal sphere lying in a hole nearby. 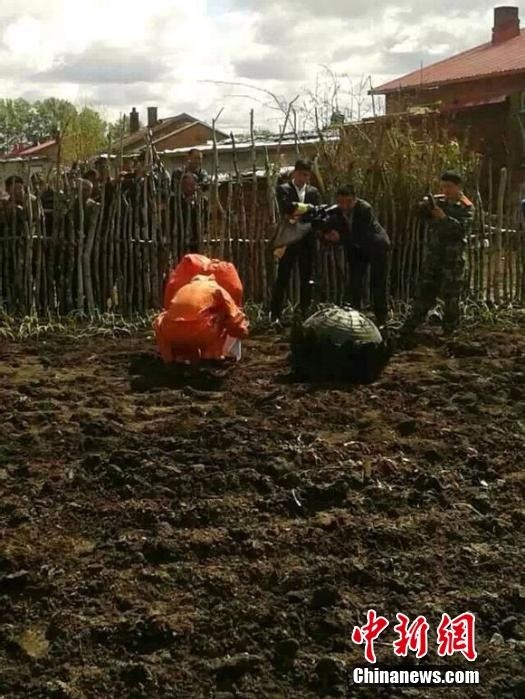 Some 20 villagers joined Mendes to help him extract the object from the ground and examine it. Mendes says the sphere is hollow and if shaken some sort of liquid can be felt swishing inside. 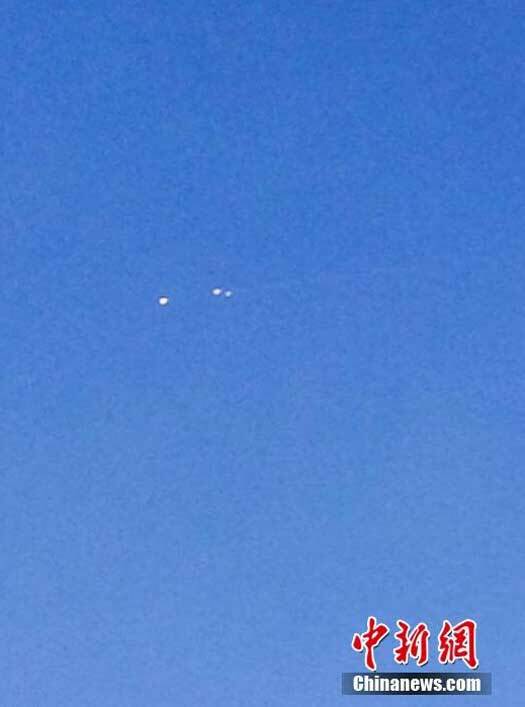 Locals quickly spread the news, as they reached the town of Mata Roma over 2,000 people flocked to see the “UFO”. 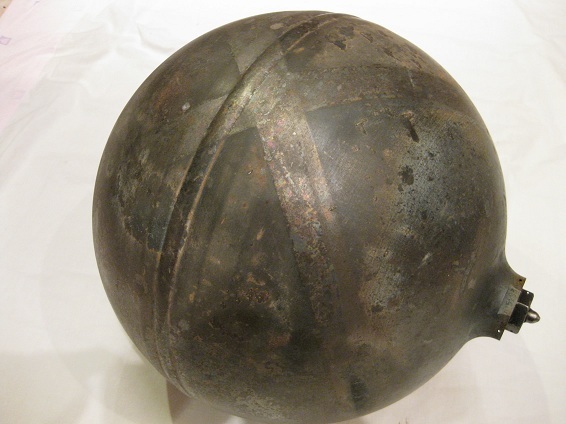 With a diameter of 35 centimetres (14 inches) and weighing 5.9kg (1.98lb) the ball has a rough surface and appears to consist of “two halves welded together”. It was made of a “metal alloy known to man” and weighed six kilogrammes (13 pounds), said Ludik. Source: Searchlight newspaper Feb.2012. 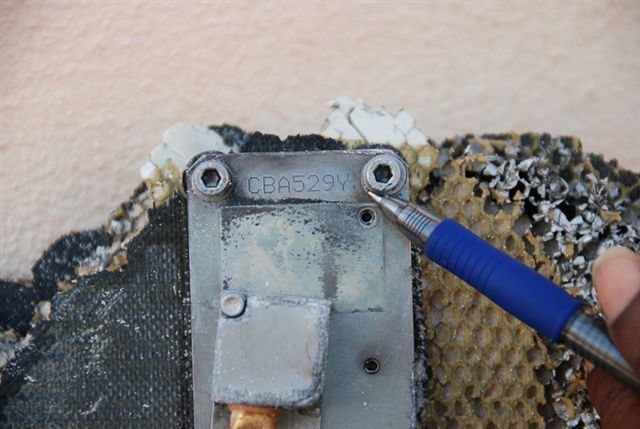 When investigating what appears to be space debris it is important to photograph identifiable markings as well as the debris itself, being careful to not move any debris from the original fall location(s) until after documentation has occurred. Cell phones can be particularly useful if cameras are not available for documentation. 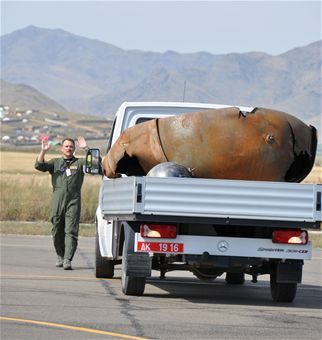 In August of 2011 US Air Force personnel were sent to Mongolia to pick up pieces of a Delta II rocket that crashed there. This account describes the operation: “There was no beeping noise as the pickup truck laden with rocket parts backed up to the C-17 Globemaster III at Chinggis Khaan International Airport in Ulaanbaatar, Mongolia, in late August. It was just a Mongolian driver and a U.S. Air Force loadmaster using hand signals to communicate. An Air Force Reserve crew from the 729th Airlift Squadron flew to Mongolia to retrieve debris from a Delta II rocket launch a year earlier. Retrieval was necessary under the Outer Space Treaty of 1967 and the Rescue and Return Treaty of 1968. The 15-person crew included three pilots, four loadmasters, two aerial porters and, just to be safe, a six-person maintenance crew with a pallet of spare parts and equipment for the C-17 Globemaster III, retreived a second-stage fuel tank and two hydrogen sphere, then returned the debris to the Space and Missile Systems Center at Los Angeles Air Force Base, Calif. “ Compare the photos above to those of other Delta II debris in the MSX reentry account earlier. Eight years after the Columbia disaster during the Texas drought, the lake level in Lake Nacogdoches, Texas dropped such that a new piece of Columbia debris was found. The sphere was one of 18 cryogenic tanks Columbia carried during its 16-day mission. It had been underwater for the past eight and half years, having landed there Feb. 1, 2003, when the shuttle broke up over east Texas during re-entry. It was uncovered recently when the lake’s water level diminished by about 11 feet during an ongoing drought. 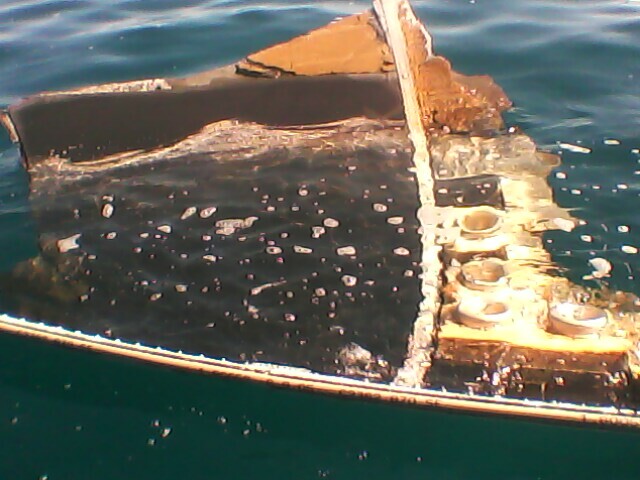 The US Coast Guard reportedly discovered this curved panel in the Tobago Keys in August 2011. 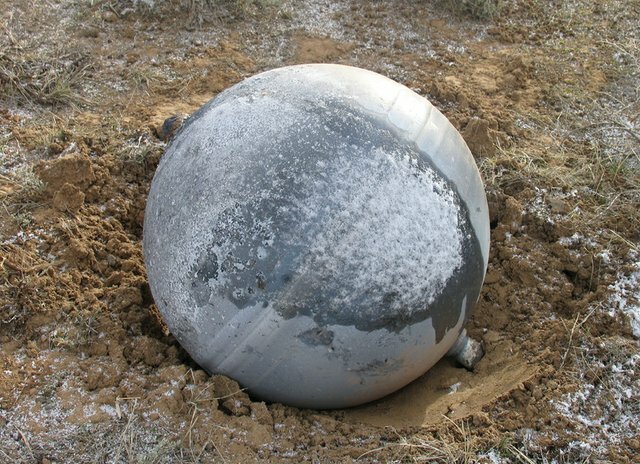 A pressure sphere from a Russian rocket stage was recovered in Wyoming, USA on March 21. 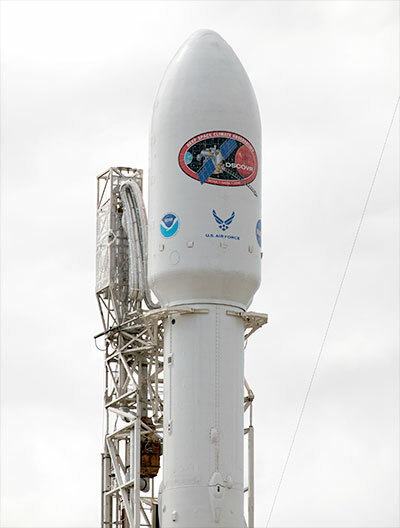 The rocket was launched January 20, 2011 associated with the Electro-L mission. Titanium sphere photo by Elizabeth Campbell. 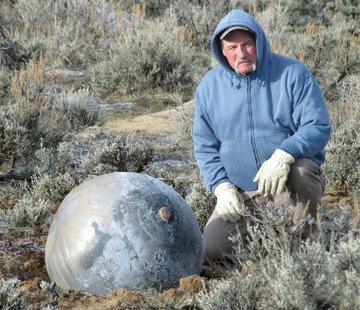 It was discovered by Wyoming resident Robert Dunn who reportedly found the tank while still warm to the touch (see next image). Photo by Elizabeth Campbell. The tank was determined to be 30 inches (12cm) in diameter and left a crater about 12 inches (4.8cm) deep and three feet (14.4cm) wide. 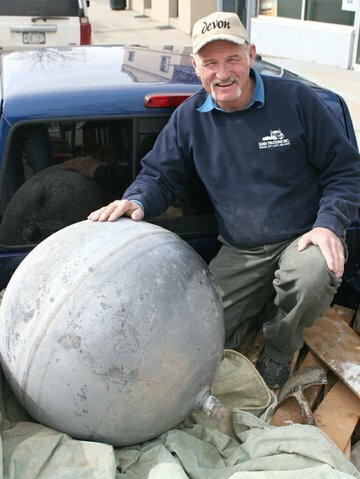 Robert Dunn poses with the sphere in its resident location. Elizabeth Campbell photo. The condition of the tank appears to be fairly good with a depression on the right lower side. Photo by Michelle Balleck. The Japanese spacecraft Hayabusa reentered the earth’s atmosphere over central Australia on June 13, 2010 after a 7 year, 4.5 billion kilometer journey. 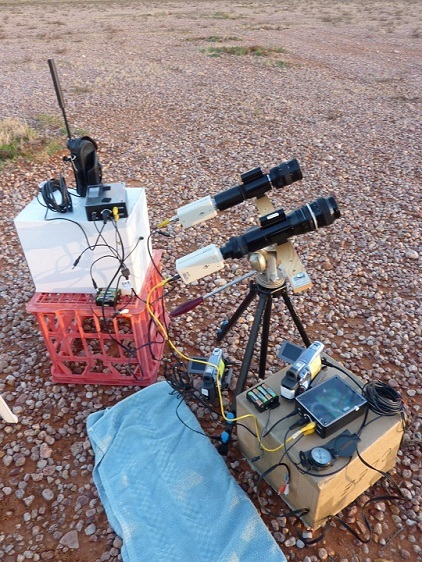 I set up a ground station at the Coober Pedy (South Australia) airport using a 75mm lens and image intensifier to record the planned reentry. However, trouble with the hardware made it impossible to capture a complete record of the occurrence. Both cameras and their mounting plate disappeared from my luggage between Houston, Texas and Adelaide, Australia. With only 2 days left after this discovery I located 3 c-mount cameras in a box of junk stored in a hotel in Coober Pedy. The cameras (courtesy of Dean Clee, Comfort Inn), covered with dust, had apparently never been used. Instead of having no usable system, I now was able to cobble together two working sets of equipment with still some last minute challenges. After brief night testing and focusing problems, some issues were overcome literally in the last critical hour prior to reentry. Skies were amazingly clear despite earlier dismal forecasts for overcast skies. In spite of the GPS time signal coming in clearly and appearing to be inserted into the video stream, the video camera (PAL format) would not display it. After the fact it was determined that the Canon camcorder (NTSC format) recorded only the first 226 lines of each frame but the KIWI OSD time inserter writes the text beginning on line 278 (per the PAL format). Also and more critically, in order to achieve perfect focus the end product images displayed on the small camcorder screen were not erect images. This made it impossible to lock on to the initial field of view in time and made it very difficult to track consistently as guiding had to be accomplished manually. Tracking was accomplished for about 15 seconds until the very short power chord of the primary camera was inadvertently severed in the dark as a result of the rapid manual tracking required for Hayabusa cutting off the video. Yet, some useful optical video data was collected. Here are a few stills from the video capture courtesy of R.Nugent who captured it using LIMOVIE. The orientation of the frame grabs were then adjusted to show the way they would have appeared as erect images from my Coober Pedy airport location north of the Hayabusa ground track. The sample return capsule (small round blob) separated hours earlier from the spacecraft bus; but optically they appear quite close together. The two became distinct only after the bus exploded at an altitude of about 75km. At first the blazing fireball overwhelms the sensor and it is not possible to make out faint stars. The bright blob is the bus and the two extended smeared images in the right center are ghost images created by internal lens reflections. 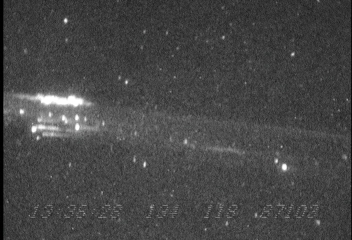 3.75 seconds after the above image this frame shows the capsule’s trail along with the debris from the spacecraft bus (above). Stars are now clearly visible. 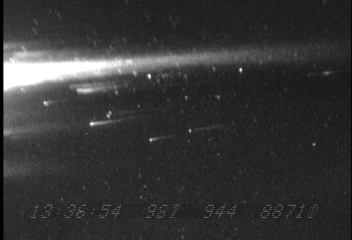 5.5 seconds after the first frame, the debris trail begins to coalesce into groups of fragments. 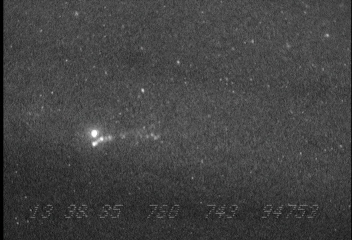 6.93 seconds after the first image many individual large bus fragments glow as separate points of light. It was shortly after this image that power to the camera was inadvertently disconnected. 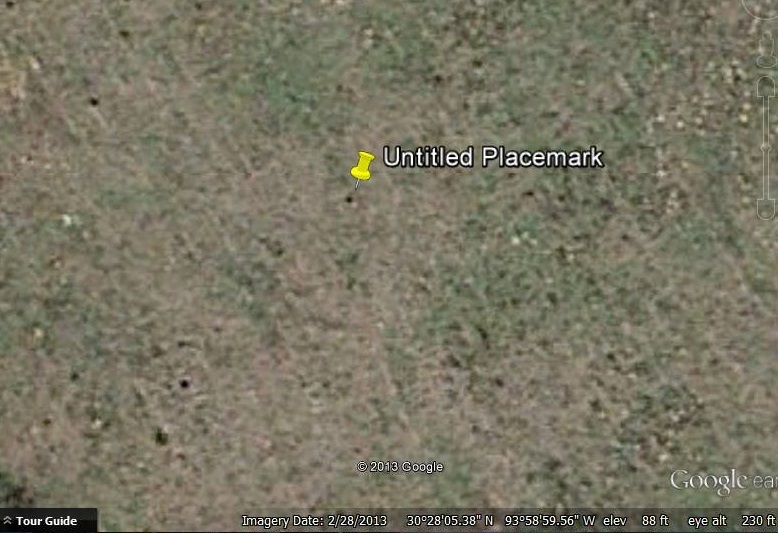 Had this event not occurred, it is expected that the capsule could have been tracked much farther than any other ground imagery site. Note how the straight trail generated by capsule separation begins to fade (right side) as chemiluminescence effects start to quickly diminish with time. Also, the trail begins to coalesce into small more highly dense clumps similar to those seen in aircraft contrails and also in Space Shuttle reentry vortices. Photo of my two video systems taken 6 hours prior to the reentry. The left camera was the one being used for tracking and recorded the frames on this page. The 8 AA battery pack sitting on the red crate as the power source that became separated from the camera in the dark as the mount swung through more than 90 degrees of azimuth travel. 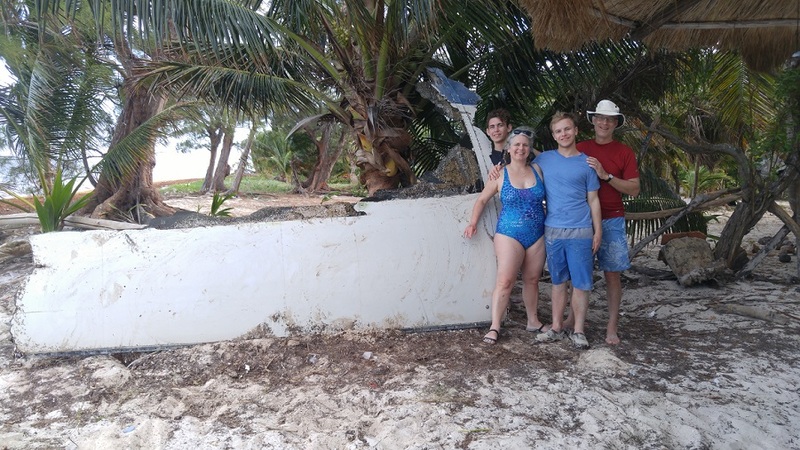 A piece of Ariane V payload fairing was discovered on a beach on the Yucatan, Mexico approximately halfway between Cancun and the Belize border. 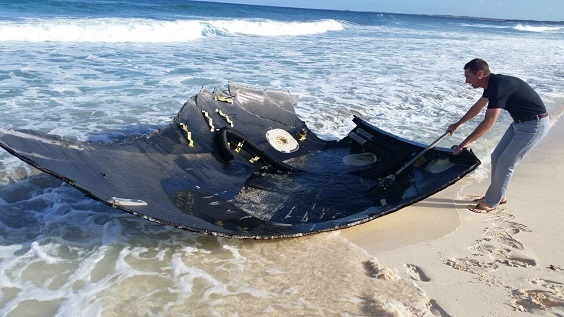 The fairing is quite similar, though not as large, as one that washed up also in Mexico in January 2013. It was 4 to 5 meters long and about 1.5 meters in length. 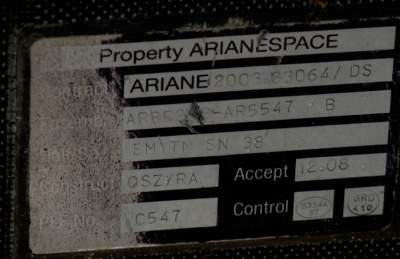 The serial number AR5547 is believed to be linked to the TerreStar-1 launch July 1, 2009. Payload fairing with people to show perspective. Beachside location where the fairing was originally found. Sometimes you can find them advertised for sale on the internet as in the photo below. Titanium sphere advertised for sale in 2009. Discovered in Mexico (location not known) this object is in private hands. It has sustained damage at both ends. A single pressure sphere on display. Credit: Open Minds Production. 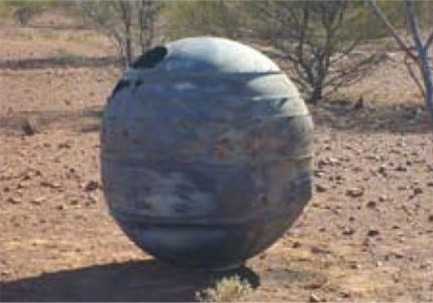 2008: TITANIUM SPHERE This casing (above) was found by A. Taylor while flying over an area in Australia in 2008 surveying cattle. From markings it was determined to be part of a Delta 2 rocket that launched INSAT 1B in 1990. Depending on the remoteness of the area it is not uncommon for objects never to be discovered or discovered decades after they have entered the atmosphere. Does this look familiar? 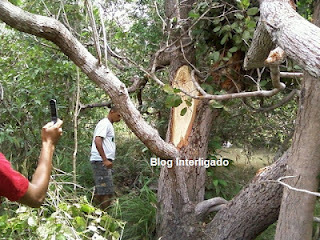 Another similar object fell in Rio Goias, Brazil around March 24, 2008. 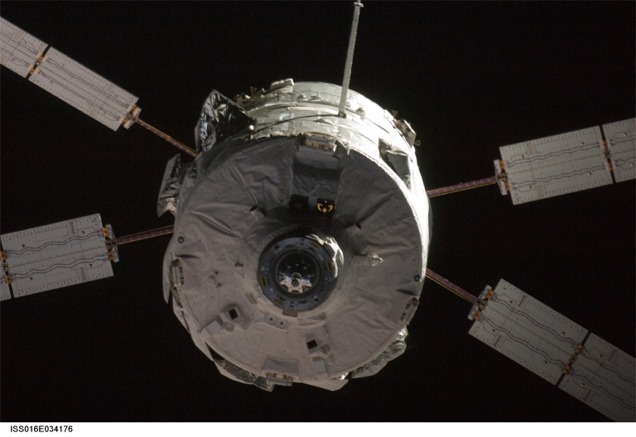 On September 29, 2008, the European Space Agency’s ATV-1 reentered the atmosphere at the end of its mission to resupply the ISS. An airborne observing campaign was organized to monitor the reentry from two aircraft (P.I. : Peter Jenniskens, SETI Institute). I had proposed to the ATV Project in 2002 that the reentry of the first flight of this new, unflown vehicle should be considered for monitoring and reentry documentation. In late 2007, Jason Hatton of ESA/ESTEC and Peter Jenniskens proposed a way to do this with help of NASA Ames and NASA Dryden aircraft. ESA funded the flight of two airplanes loaded with instrumentation to intercept the entry path. The first ATV vehicle to fly in space as it moves away from the International Space Station. Two experiments I proposed were flown onboard a Gulfstream aircraft and used by Ed Barker to obtain more than 3 minutes of video. An image sequence is shown below. These photos were extracted from an 8mm video shot with a 75mm objective lens and image-intensified. The imagery was obtained when the Gulfstream was about 13,000m altitude and were provided courtesy of the NASA Orbital Debris Office. 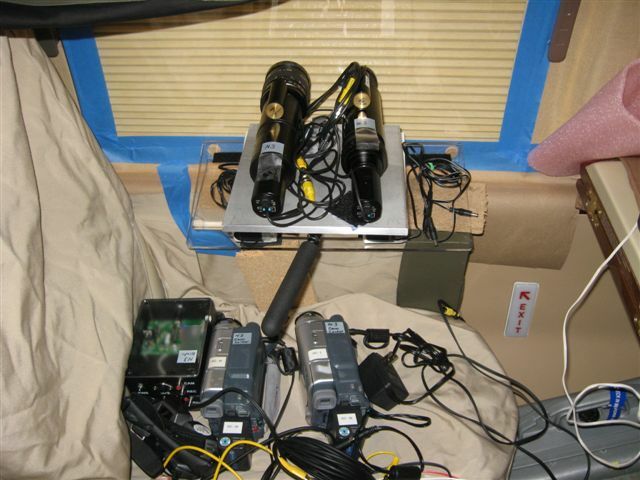 Two portable video imagers set in the 17-inch window of the Gulfstream were used to capture the data. First image. Note time stamp below each photo in hours, minutes, seconds, milliseconds. 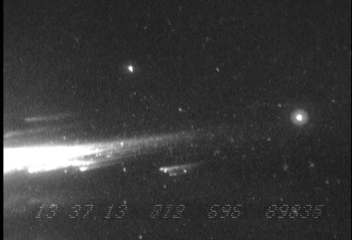 The three objects to the lower left of the fireball are internal lens reflections and are not debris. 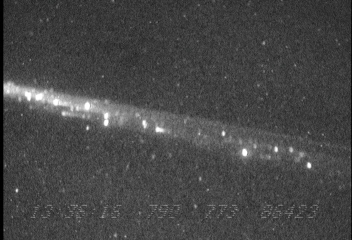 This image shows a view behind the main fireball as debris star to trail backwards. Each piece of debris can be seen, some are still ‘on fire’; others have a stellar appearance. It is also possible to discern separate streams of particles moving within the reentry pathway. At 13:36:20 an explosion occurred. The resultant cloud is shown above. 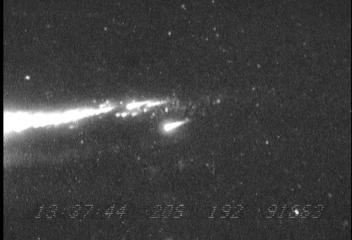 The main fireball is visible here and one can see how overbright it is such that you cannot make out any definition within its close proximity. A galaxy is faintly seen below the bright star (Alpha Centauri) on the right side of the above frame. 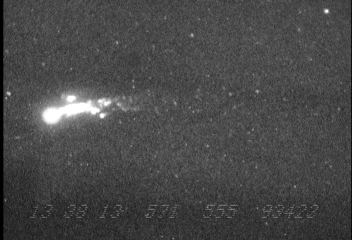 The fireball begins to lose its cohesiveness as more and more debris is shed. 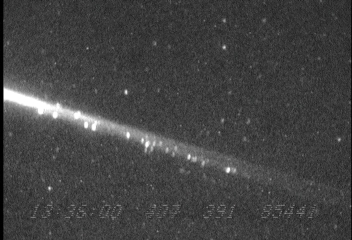 A glow can be seen from the last major portion of the fireball as it moves toward the horizon. ATV-1 is almost eclipsed by the aircraft structure. 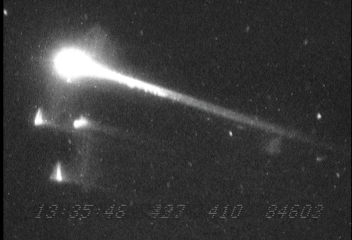 The last image of the fireball and its trailing pieces. 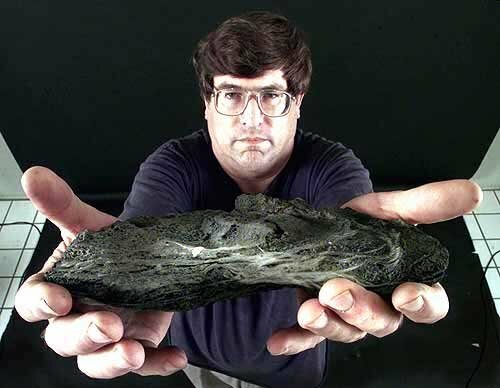 Then there are these images from James Stirten who found this object 54 cm wide and weighing 20kg in 2007 at a location about 800km west of Brisbane, Australia. 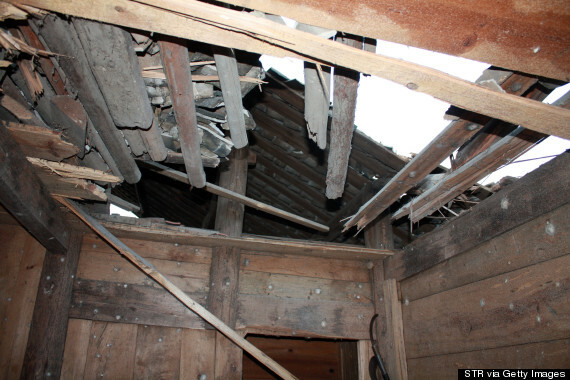 The people who live in the village of Korgon in Russia periodically have rocket debris which falls in their area. 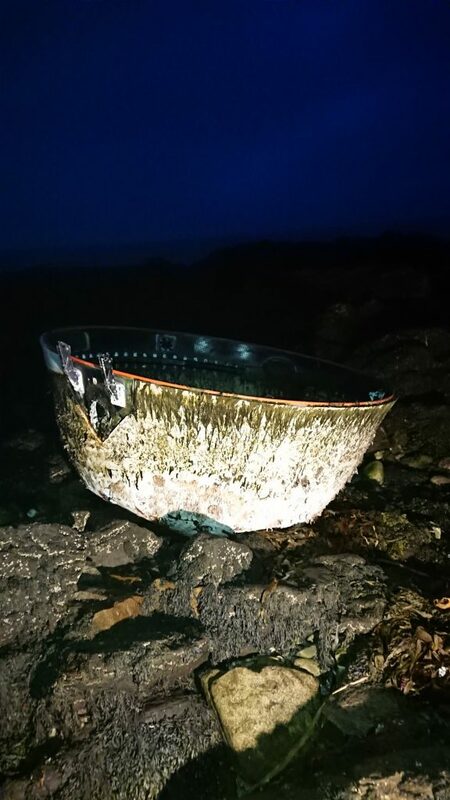 Source: http://www.storee.se/index.php?option=com_k2&view=item&id=1428:Bombarded by Space Debris The above piece of debris was recovered and is technically not space debris in that it came down during the ascent process. 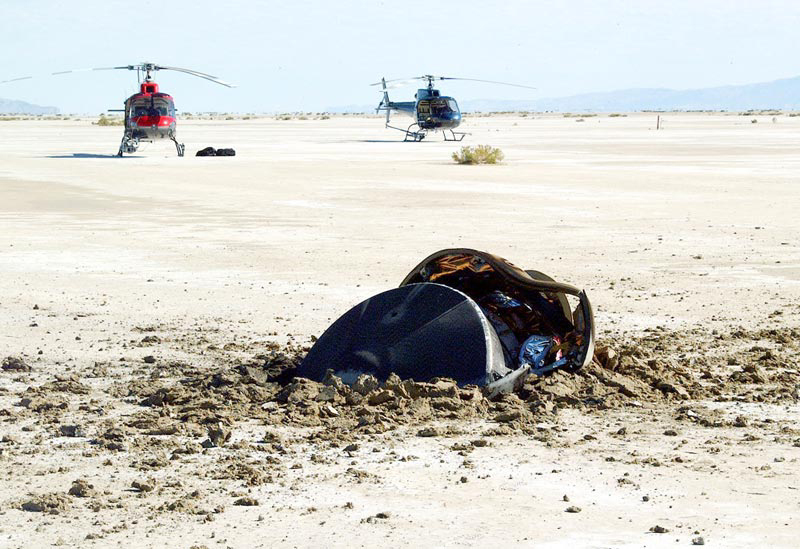 A capsule carrying interstellar dust reentered the earth’s atmosphere at 12km/second and was protected by an ablative material which resulted in the successful recovery of its contents. 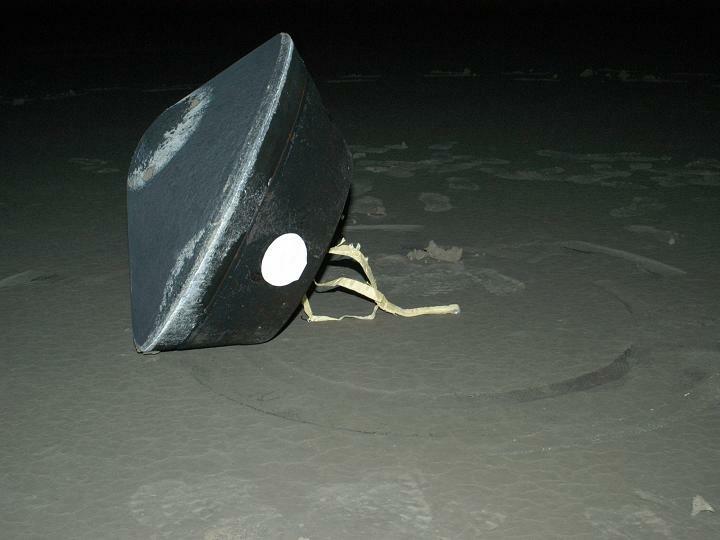 The landing was on January 15, 2006 after a six year trip. “For the third time in four years, a PAM-D (Payload Assist Module – Delta) solid rocket motor casing has been recovered after an uncontrolled atmospheric reentry. Coincidentally, all three reentries occurred during the month of January in the years 2001, 2004, and 2005. All were also utilized in the deployment of NAVSTAR spacecraft for the U.S. Global Positioning System (GPS). The most recent event occurred on 13 January 2005 when the NAVSTAR 49 PAMD (2000-071C, U.S. Satellite Number 26607) reentered over Asia. 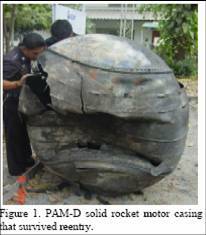 The titanium casing of the STAR-48B solid rocket motor was subsequently found near Bangkok, Thailand (Figure 1). 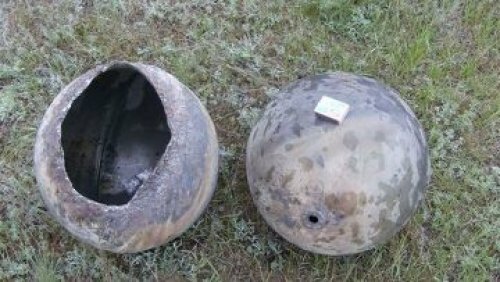 The egg-shaped object had a diameter of 1.2 m and a mass of more than 50 kg and closely resembled the casings found in Saudi Arabia in January 2001 and in Argentina in January 2004. “The Star-48 rocket motor, which is connected to the satellite until the motor is done firing, completed its mission and began orbiting the Earth. 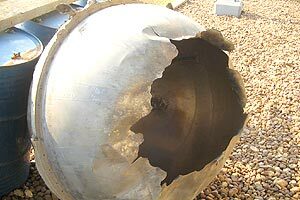 The titanium rocket motor casing reentered Earth’s atmosphere Jan. 13, 2005. 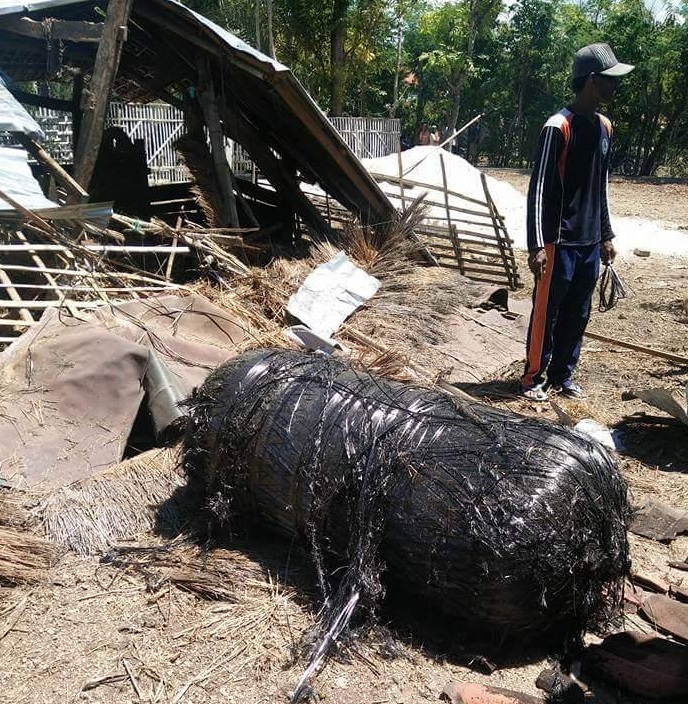 The motor landed in the rural province of Chachoengsa, Thailand (about 100 km east of Bangkok), and reportedly bounced approximately 200 meters. Fortunately, there were no reported injuries or damages. 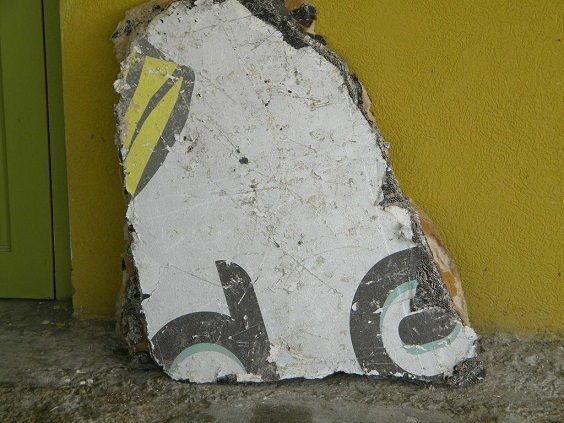 Shortly thereafter, the local Thai police recovered the debris, and Thai government officials shortly began making plans to put the debris in a museum. 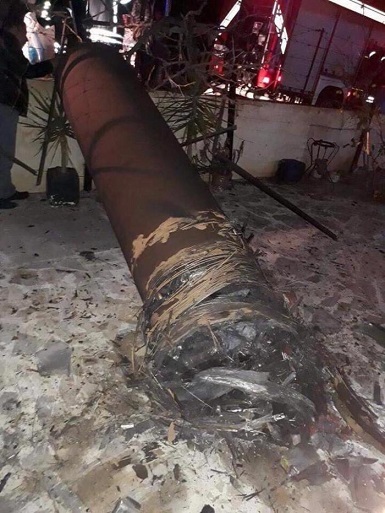 However, the U.S. Department of State and its embassy staff in Bangkok began negotiations with Thai officials to recover the rocket motor and have it returned to the United States for reentry orbit analysis. 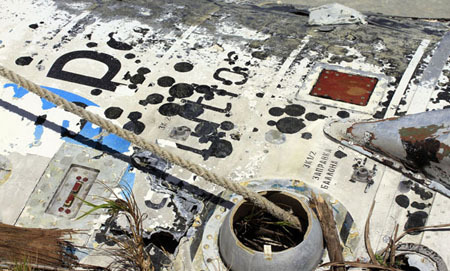 The recovered debris is believed from a Delta launch October 26, 1993 to place the NAVSTAR-34 GPS into orbit. Note the similarity in the physical appearance of the picture on the lower left in this sequence and the image which landed in Saudi Arabia. Accounts indicate that the object leaked a yellow liquid. 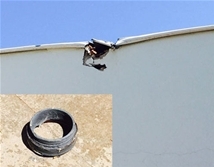 No injuries were reported from the impact which occurred in the afternoon in a field belonging to the Bolo family 15km from the city of San Roque. Thanks to Luis Augusto Reggiardo for the above information. 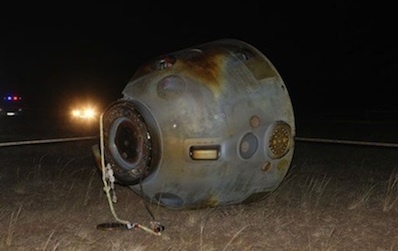 Another capsule landed and was recovered but not in good shape since the spacecraft parachute failed to deploy properly. 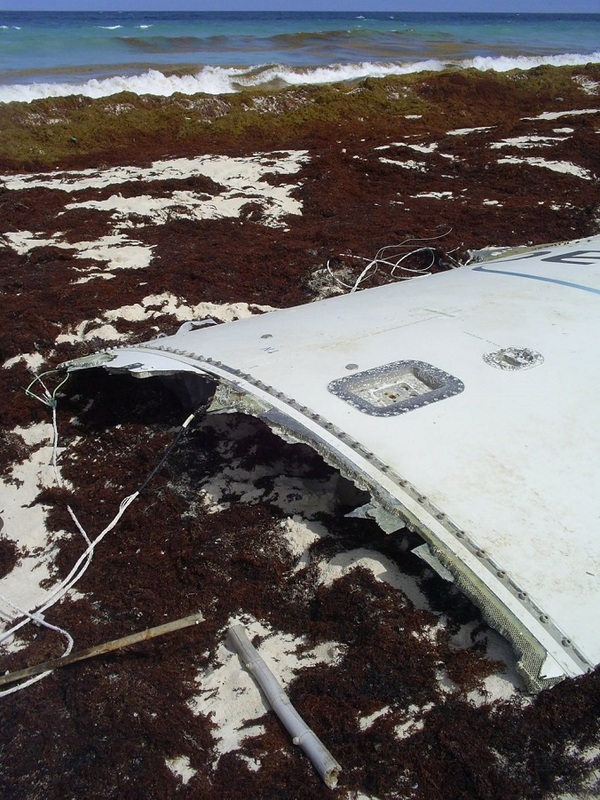 Landing occurred September 2004. 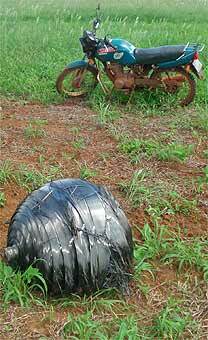 An oxidizer tank was found near Belem (Para), Brazil in August 2006 related to the reentry of Telstar 402 which occurred November 14, 2004. It measured about 80 cm in diameter and was 1m in height. 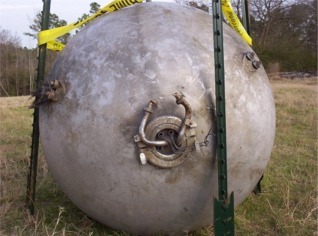 The owner of a farm found this tank 2 years after the actual reentry. The tank probably belonged to the Ariane 3rd stage rocket. 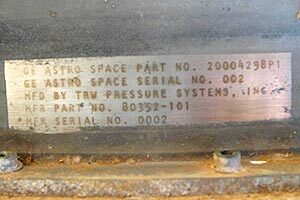 Note the marking from GE Astrospace. 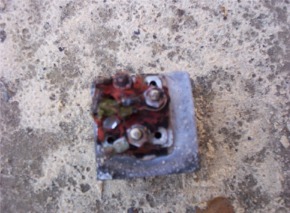 An end view shows significant damage from the inside out. On April 27, 2003 at 1535UT several pieces of an Atlas rocket stage launched in 1998 fell on a farm in Mataquesquintla, Jalapa, Guatemala. 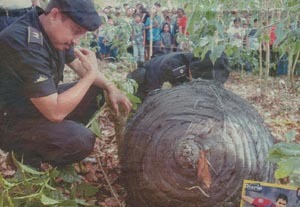 The principal object shown above is 1.2 m in diameter and is spherical and was immediately transported to police headquarters in Guatemala City. 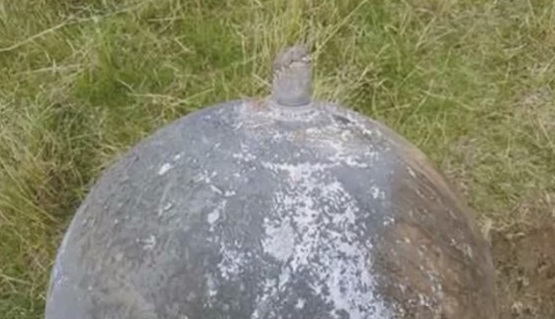 It was seen hitting a hill and rolling down to the point where it was found and reported. You can see the trend that hardened spherical objects are more prone to survive reentry intact. The sphere bears keen resemblance to the Shuttle fuel cell shown at the top of this page. Fanhui Shi Weixing (FSW, 返回式卫星), or “recoverable satellite” in its English translation, is a series of remote-sensing satellites launched and operated by the People’s Republic of China (PRC). Between 1974 and 2006, there were a total of 24 FSW satellites in six variants being launched, of which 22 were recovered successfully. 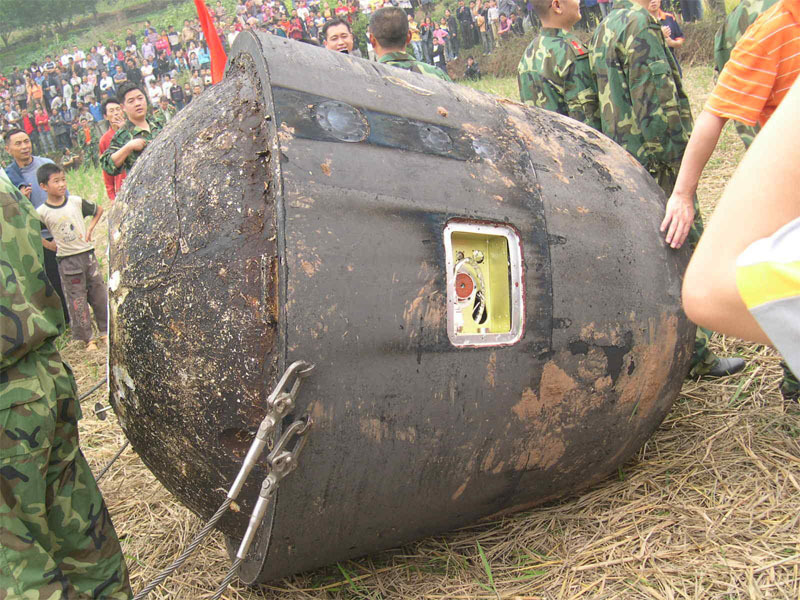 Source: http://www.sinodefence.com/space/military/fsw.asp Above is a photo of an FSW reentry capsule after its landing. A Chinese satellite capable of imaging from space and returning those images in a recoverable capsule is another example of a reentry. However, this one is non-destructive in nature. 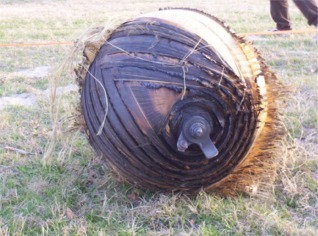 The photo above shows an example of a normal recovery of this capsule. This one was launched November 3, 2003 and landed some 18 days later in Sichuan Province, China. Sometimes the capsule does not land nominally. FSW 3-3 was a recoverable, photo-imaging spacecraft that was launched on 27 September 2004. Its purpose was advertised to be used in scientific research, geological surveying, and mapping. 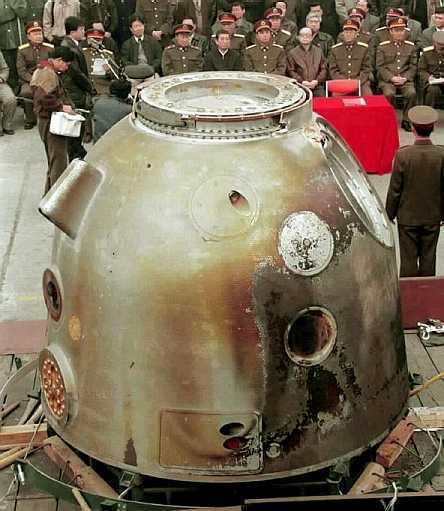 After its 18 day mission the capsule returned to Earth on October 15, suspended on its parachute, crashed through the roof of a house in the village of Penglai, Sichuan province. Although I have a separate page for STS-107 reentry debris, the following are some representative examples of pieces that survived reentry. Fuel Cell (as you scroll down through this page you will see how familiar this shape is for objects that have survived reentry through the Earth’s atmosphere) Tank Connectors Debris can land anywhere, for example on top of a roof. …in the street. …at a gasoline station.